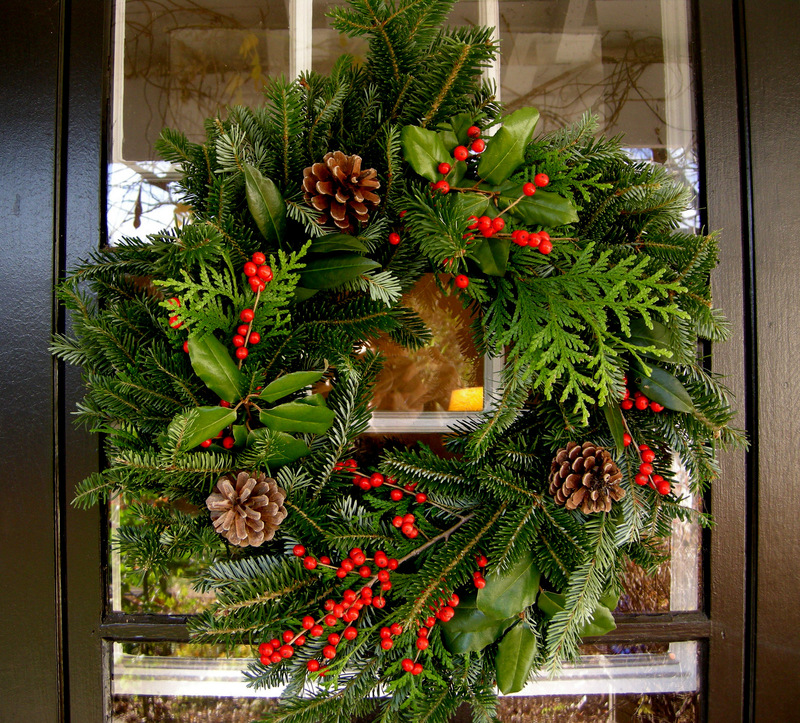 Every year I make a Christmas wreath using all natural materials from my property. 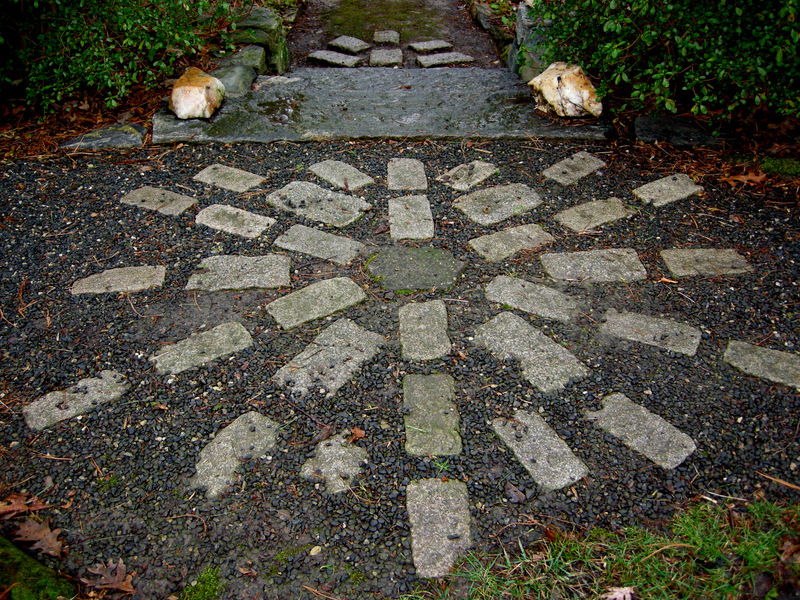 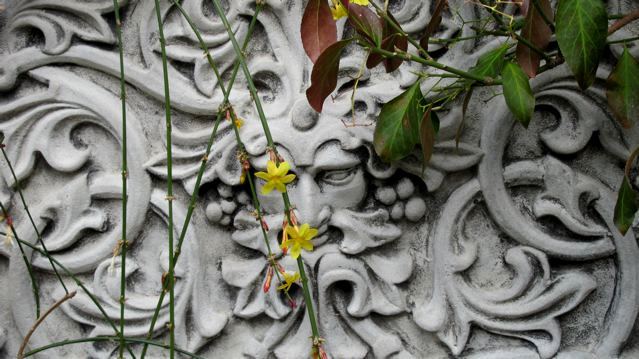 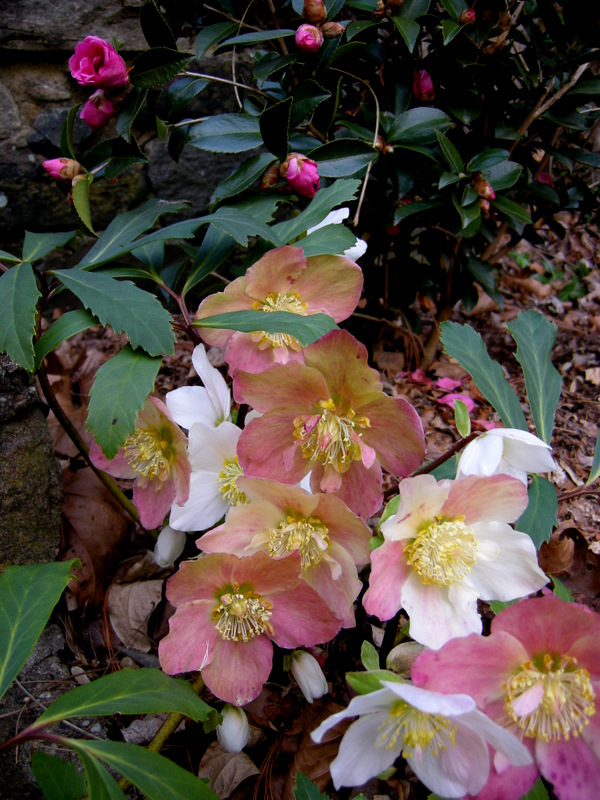 It is the middle of the month and time to participate in Garden Blogger’s Bloom Day hosted by May Dreams Gardens where gardeners from all over the world publish photos of what’s blooming in their gardens. 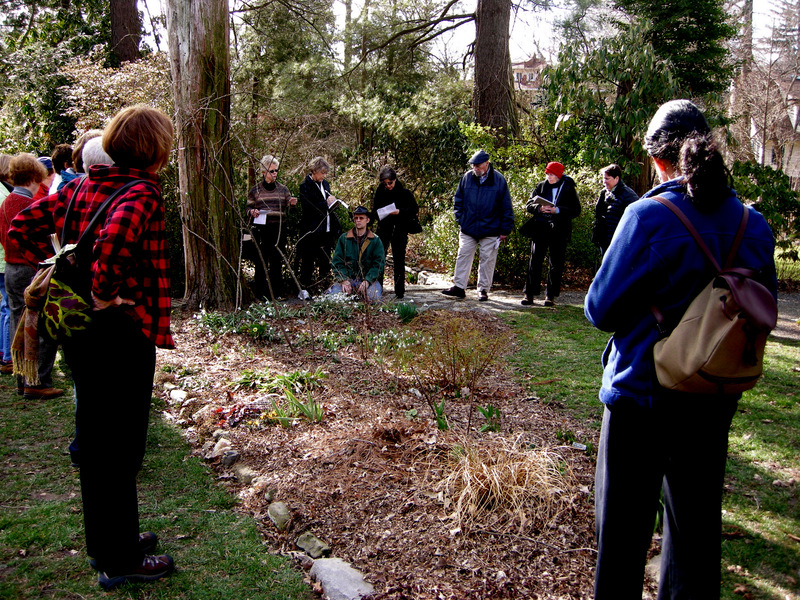 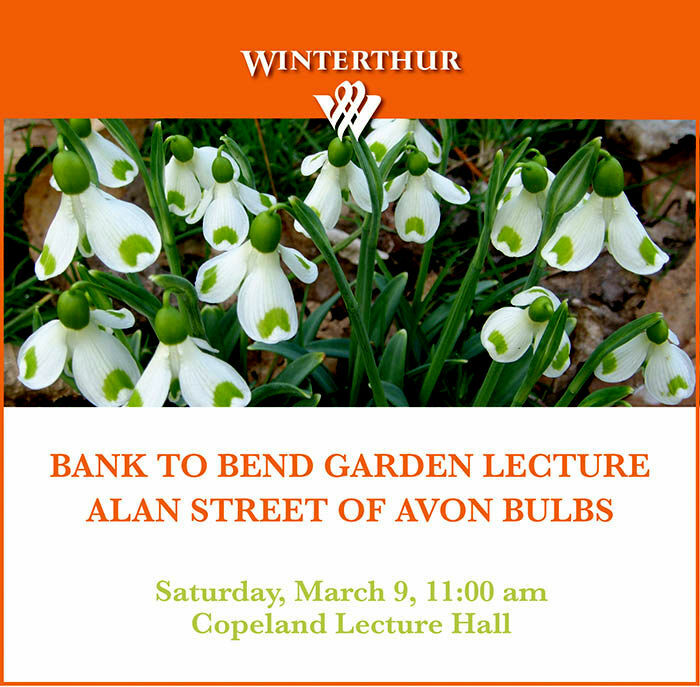 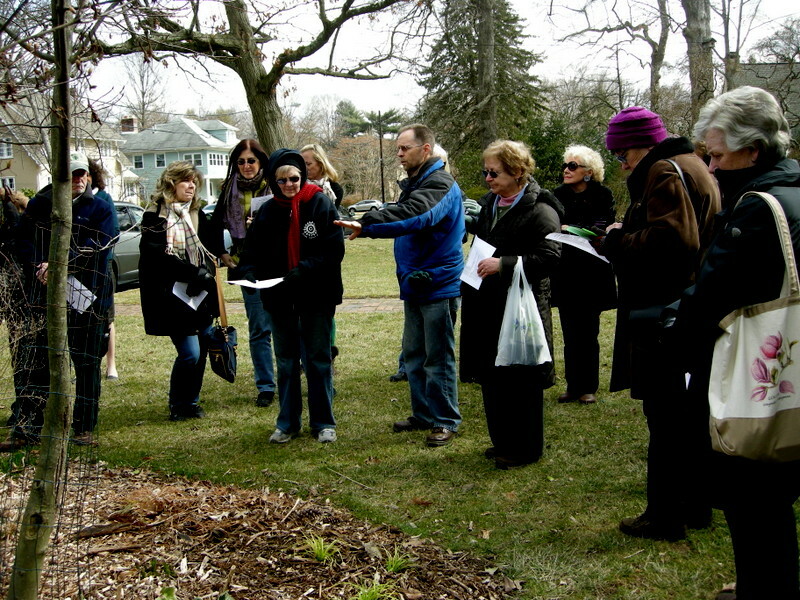 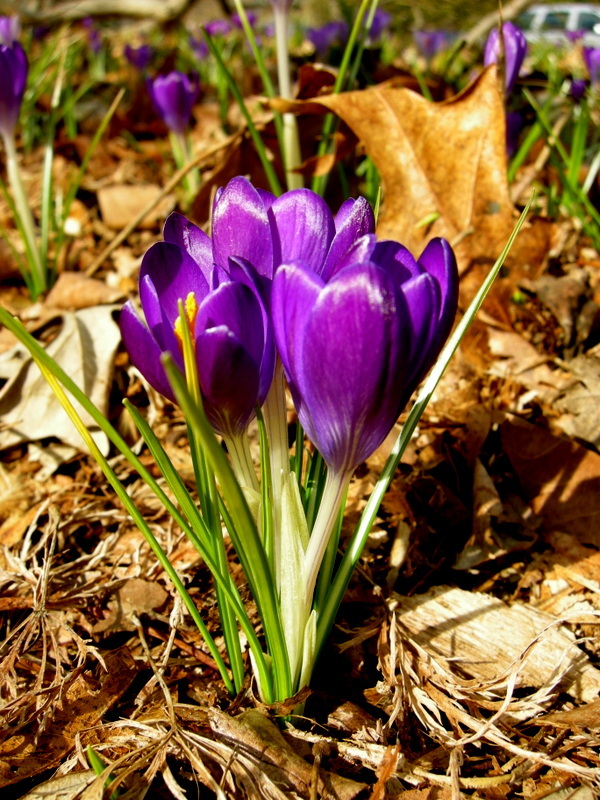 I participate because it is fun and educational for me to identify what plants make my gardens shine at different times of the year. 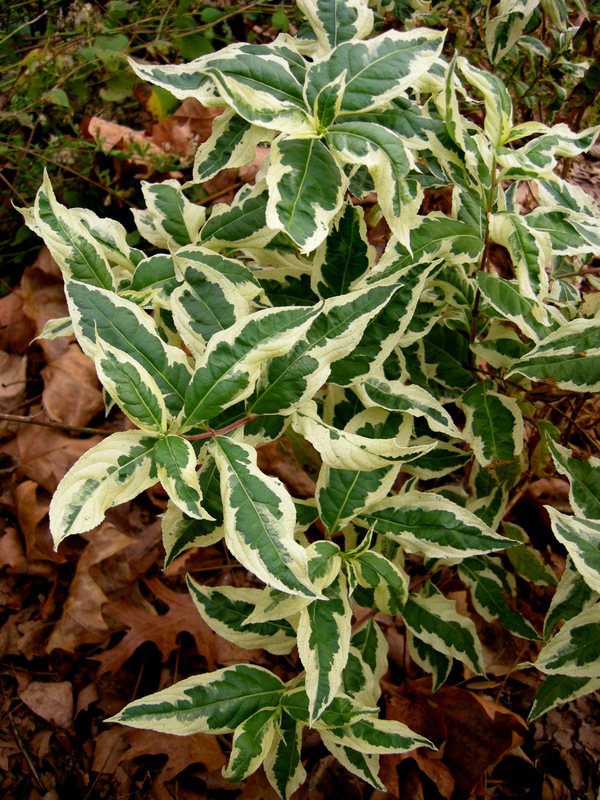 I also hope that my customers will get some ideas for plants to add to their own gardens to extend their season well into late fall. 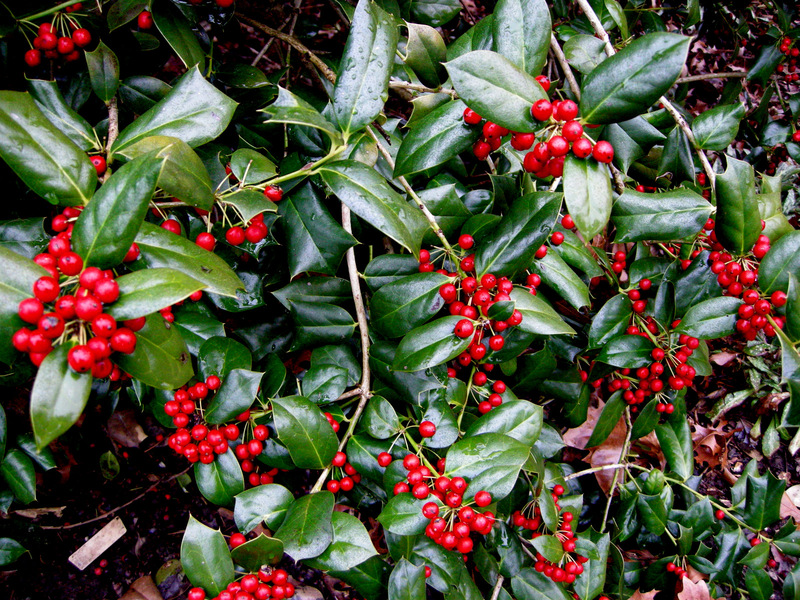 I used berries from this native winterberry holly, Ilex verticillata ‘Red Sprite’, to make the wreath. 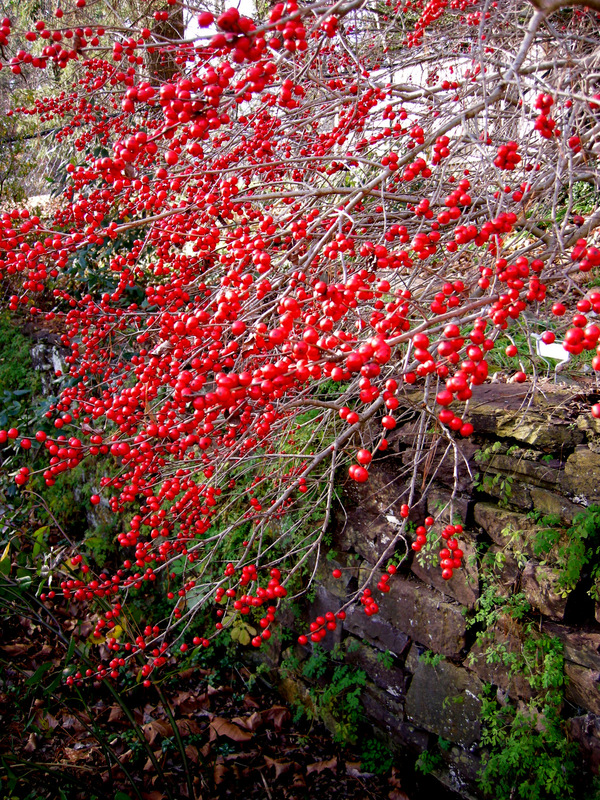 On December 7, the robins came and cleaned off all the berries. 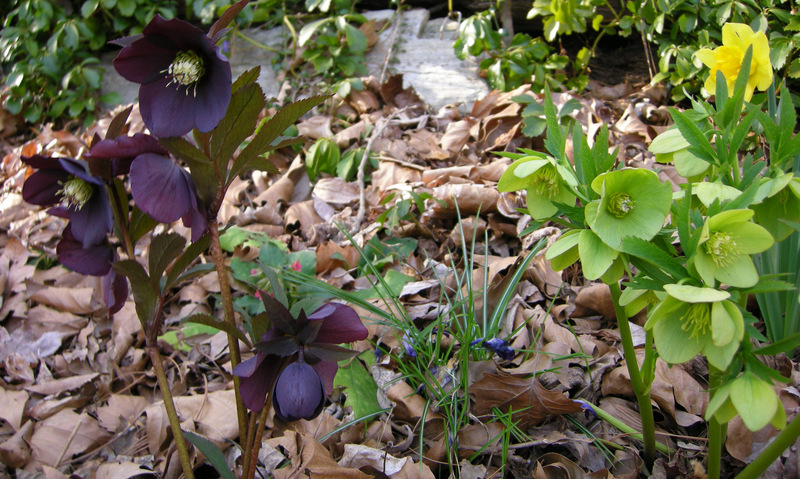 Last month was still prime time in my gardens, but now with hard frosts and generally colder weather, my gardens are past their prime. 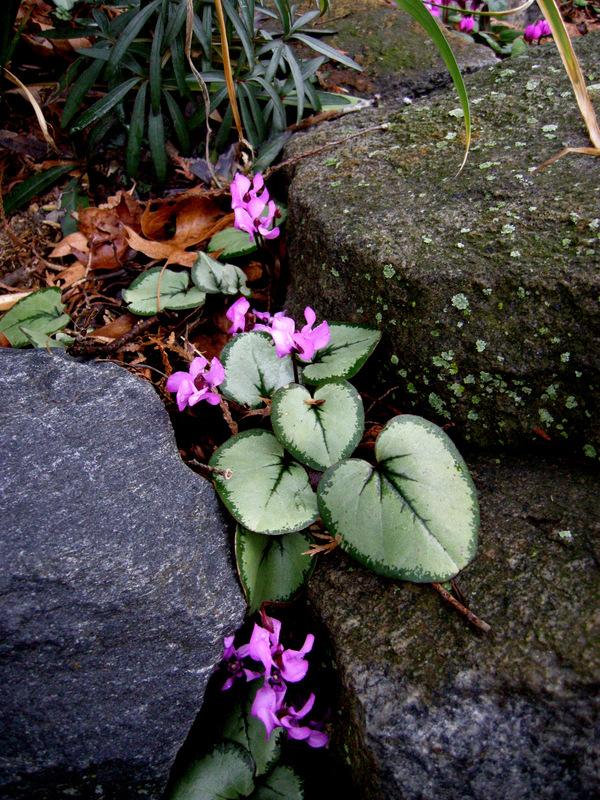 The show goes on though with the focus shifted from the garden as a whole to individual plants peaking between November 15 and December 15 (I do not take all my photos on December 15). 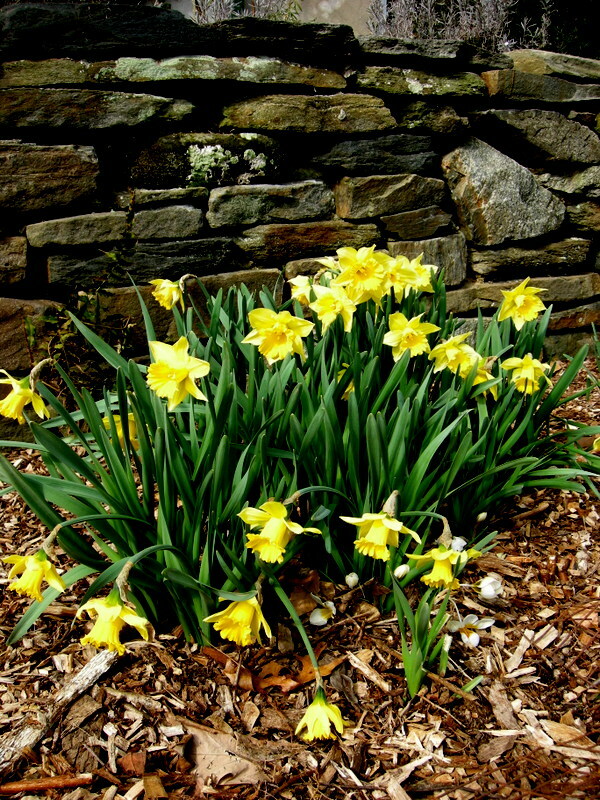 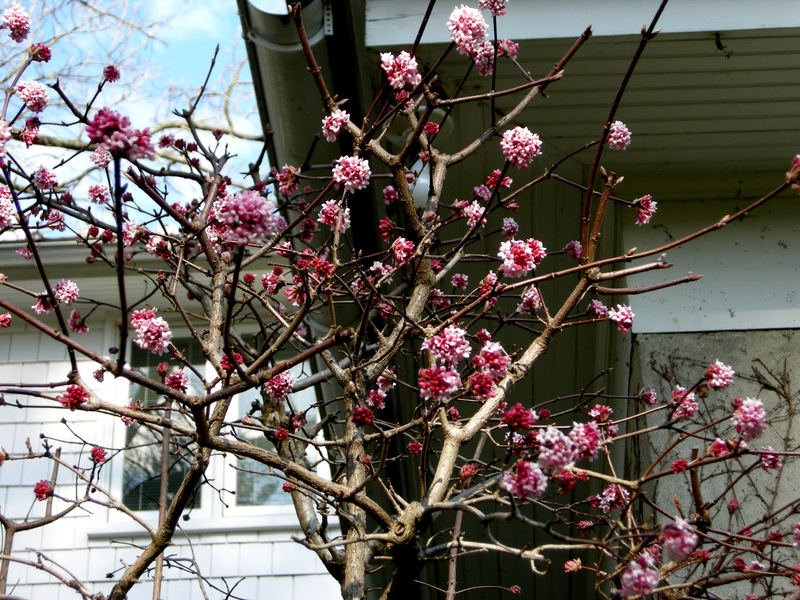 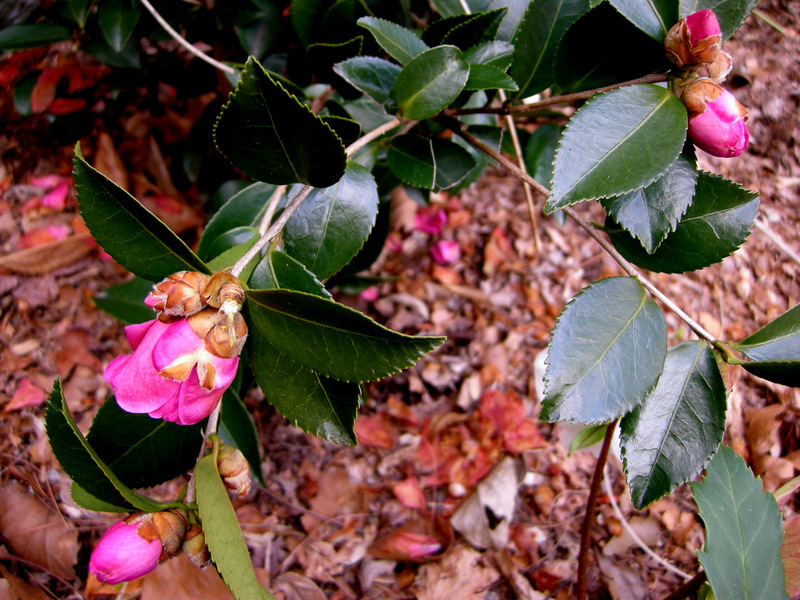 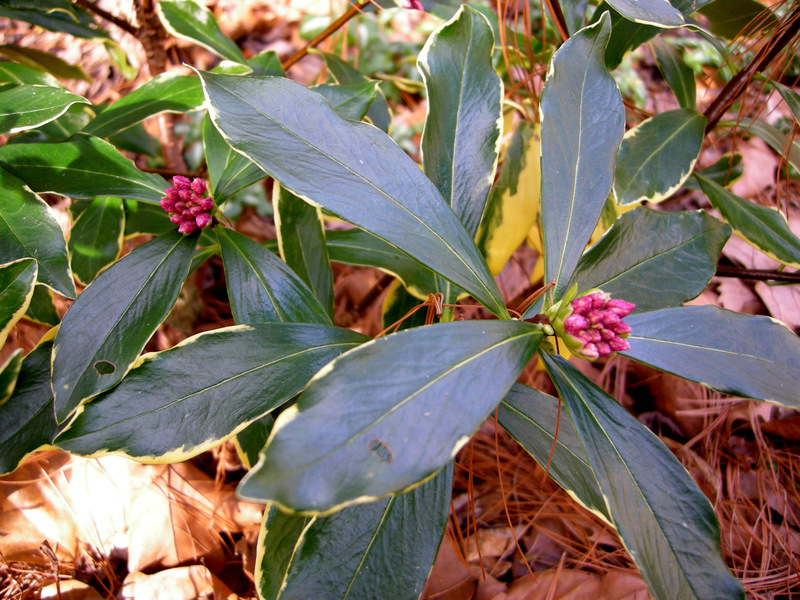 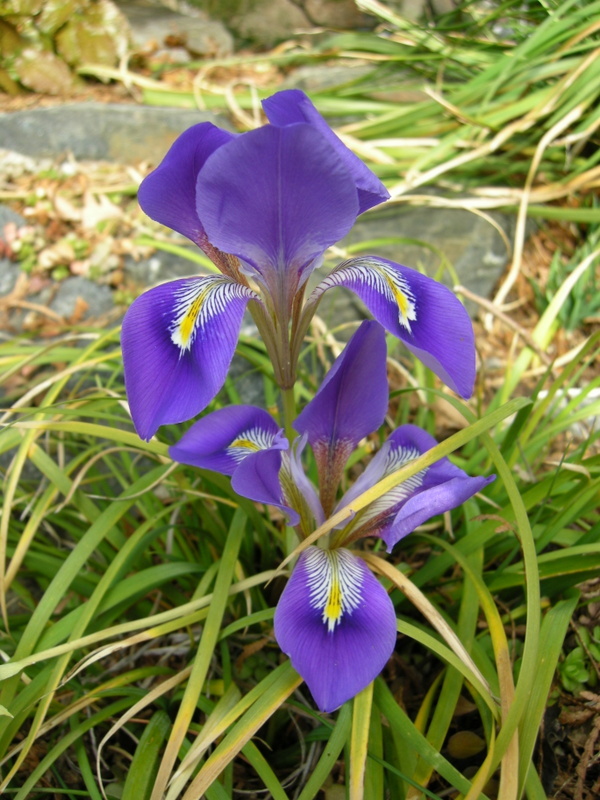 This means that they bloom now (or are still blooming), have ornamental fruit, or feature exceptional foliage or fall color during this period. 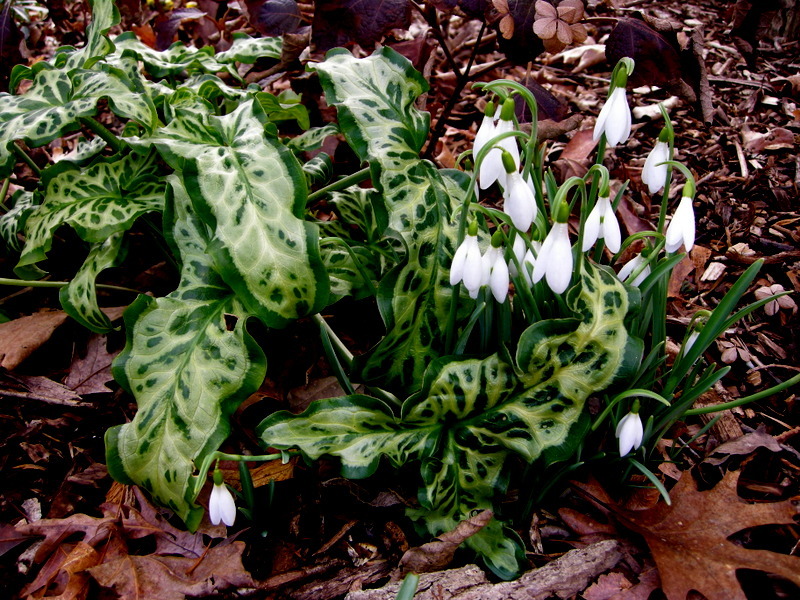 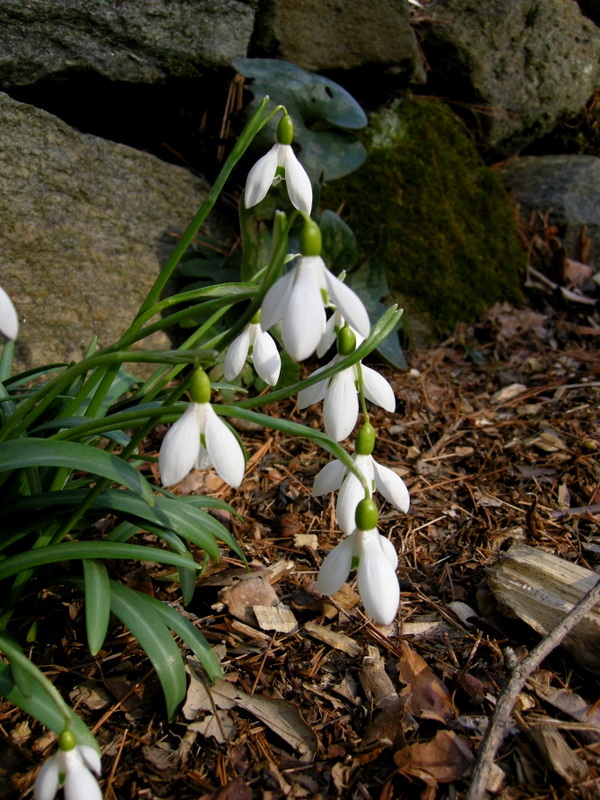 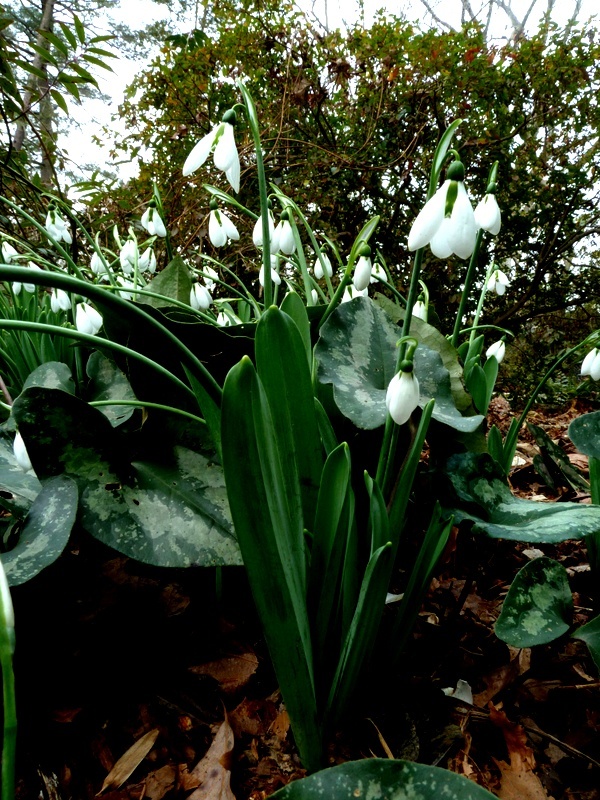 The large and vigorous fall-blooming snowdrop ‘Potter’s Prelude’ is in full bloom through this entire period. 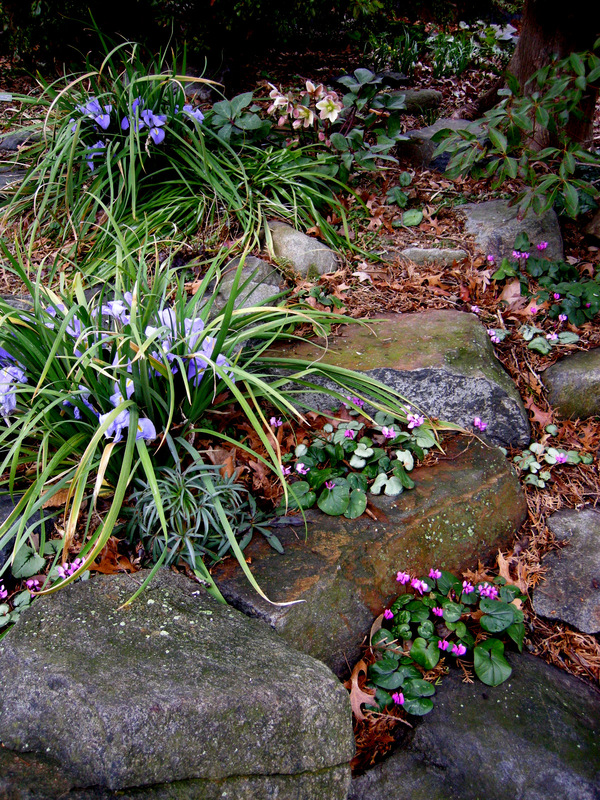 Mine is surrounded by the marbled purple foliage of ‘Frosted Violet’ coralbells, Heuchera villosa ‘Frosted Violet’. 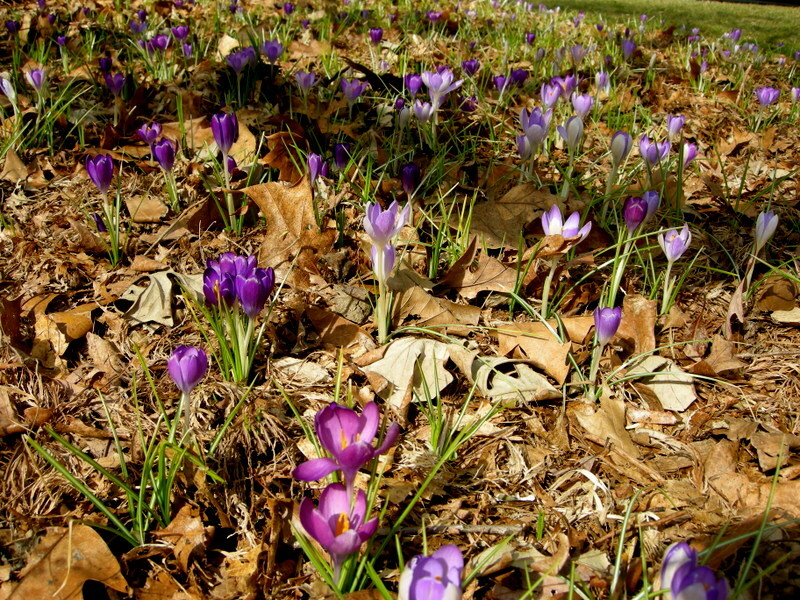 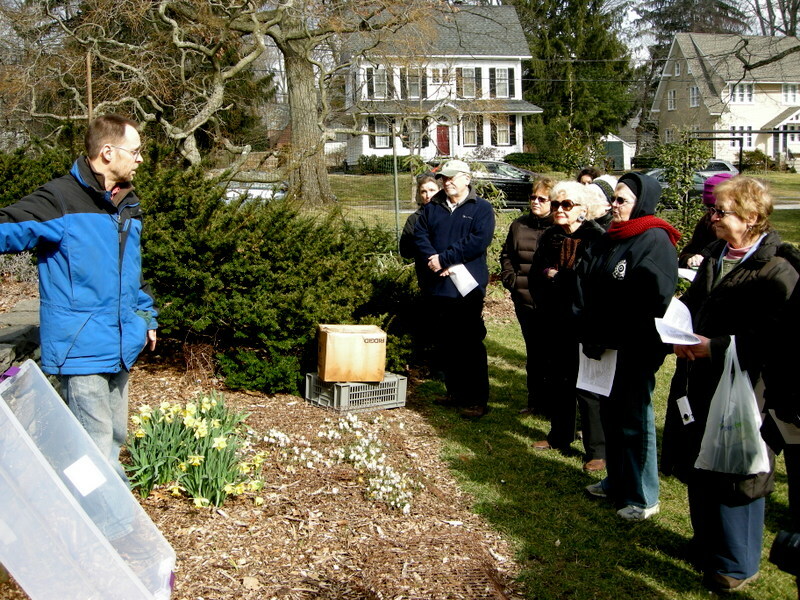 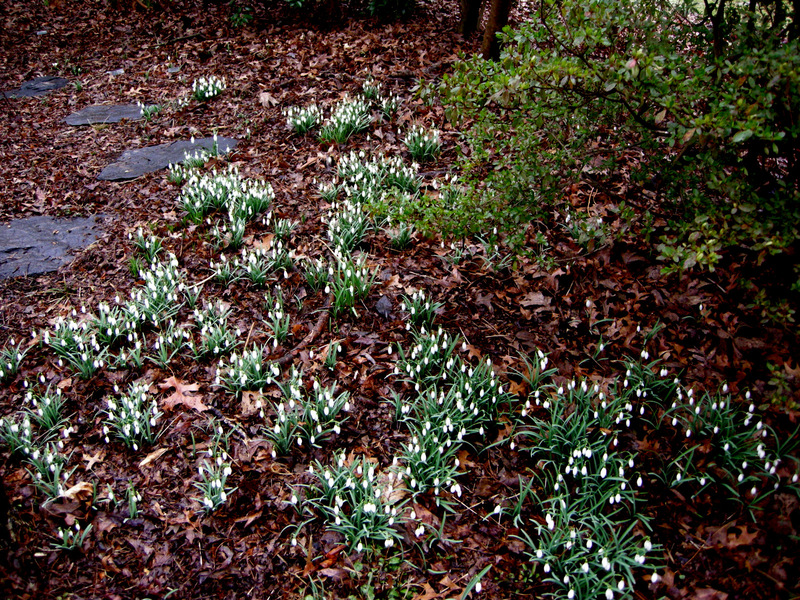 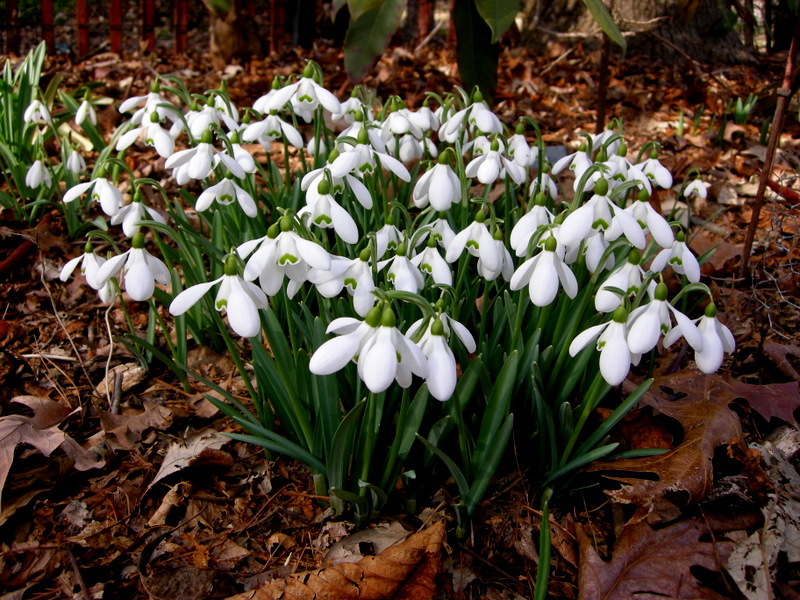 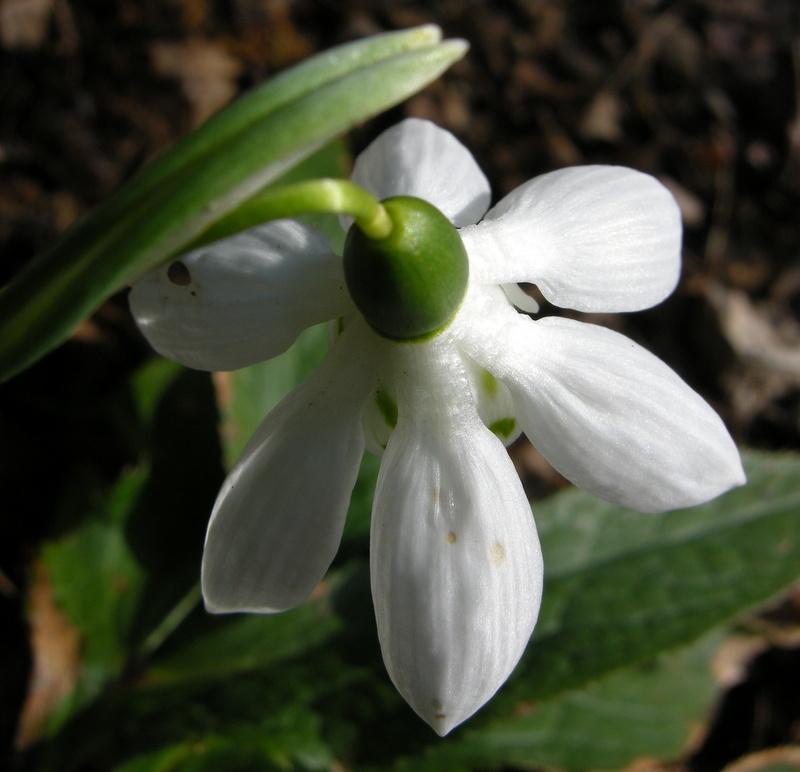 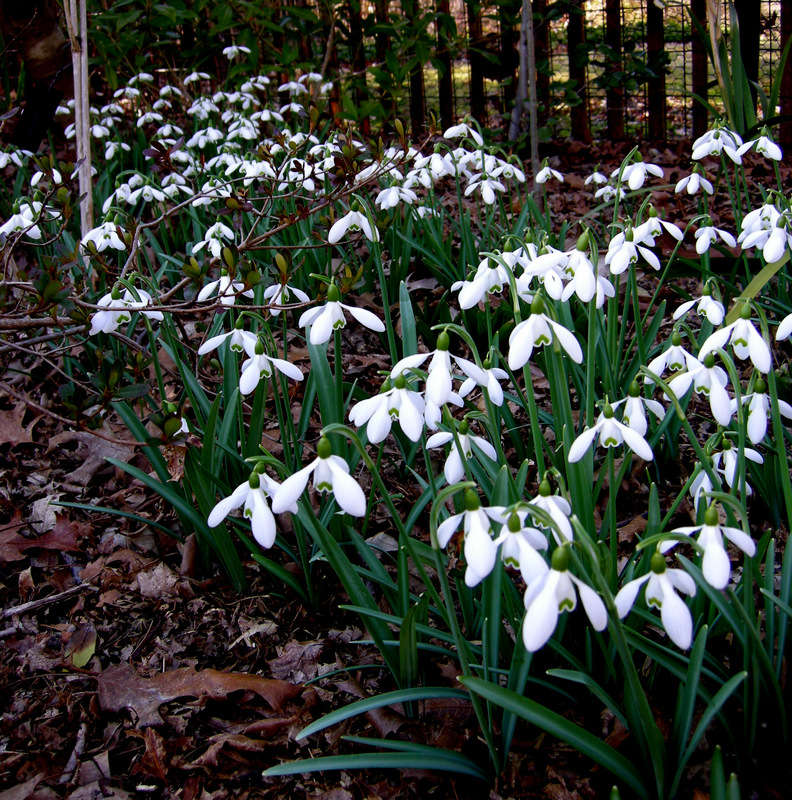 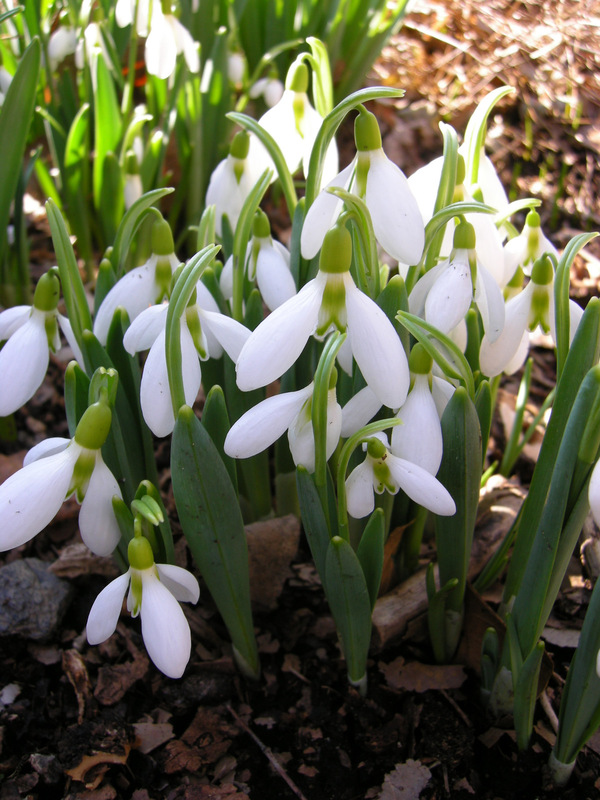 For more on fall-blooming snowdrops, click here. 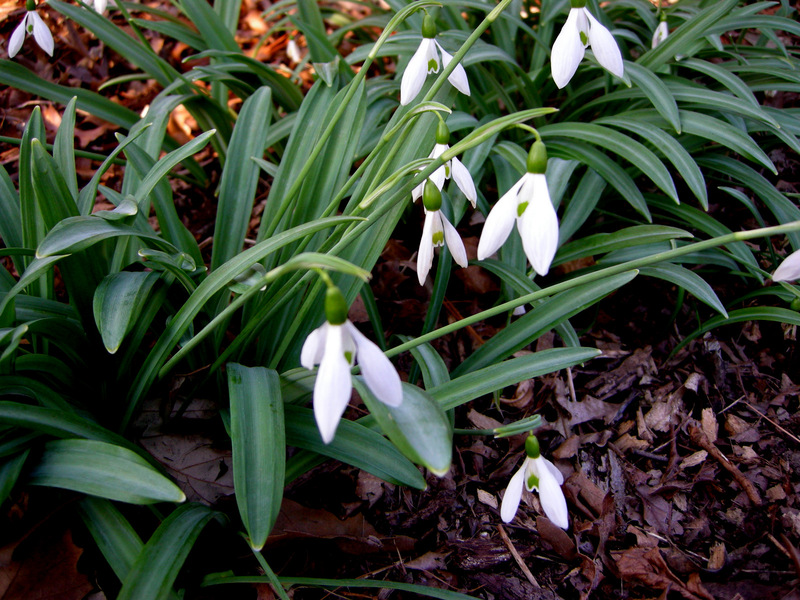 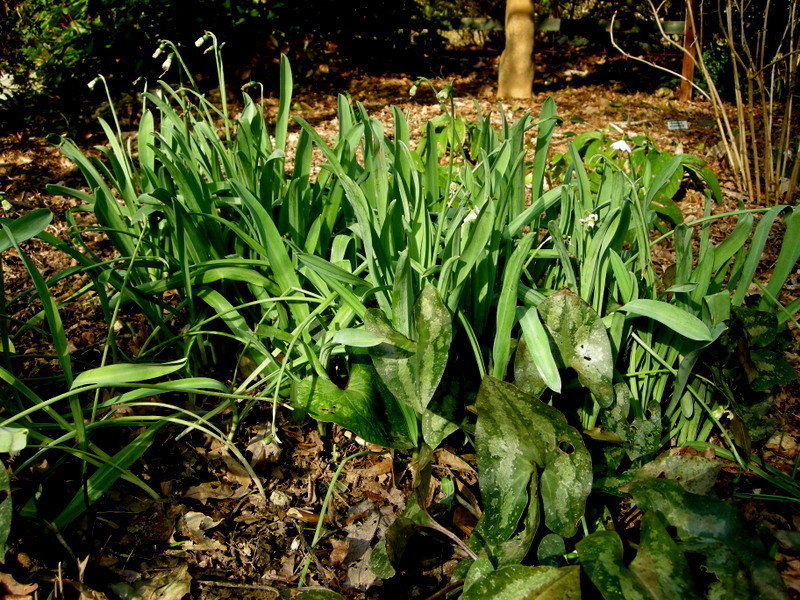 Over the years, I have planted hundreds of giant snowdrops, Galanthus elwesii, and in the process have acquired plants that bloom in the fall instead of January when this species normally blooms. 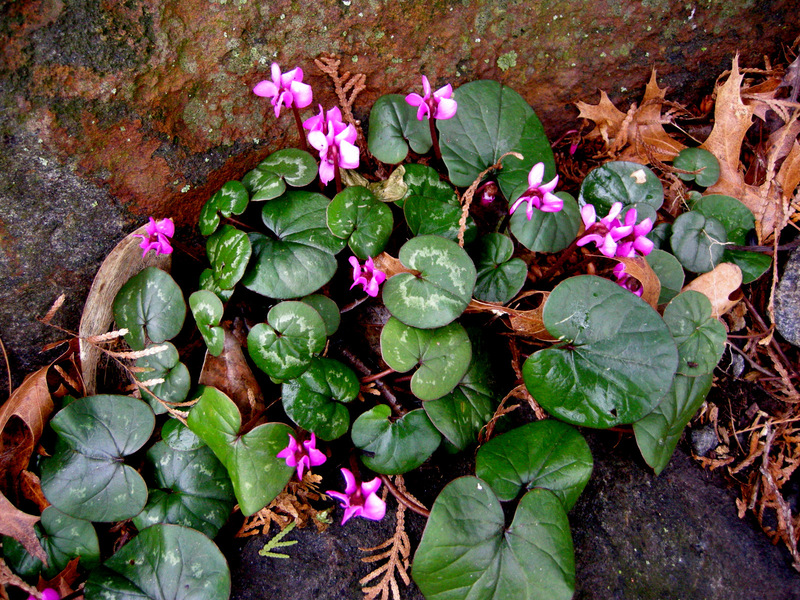 I am always raving about the long bloom time of ‘Shell Pink’ lamium so I thought you might like to see a photo of it in full bloom in December. 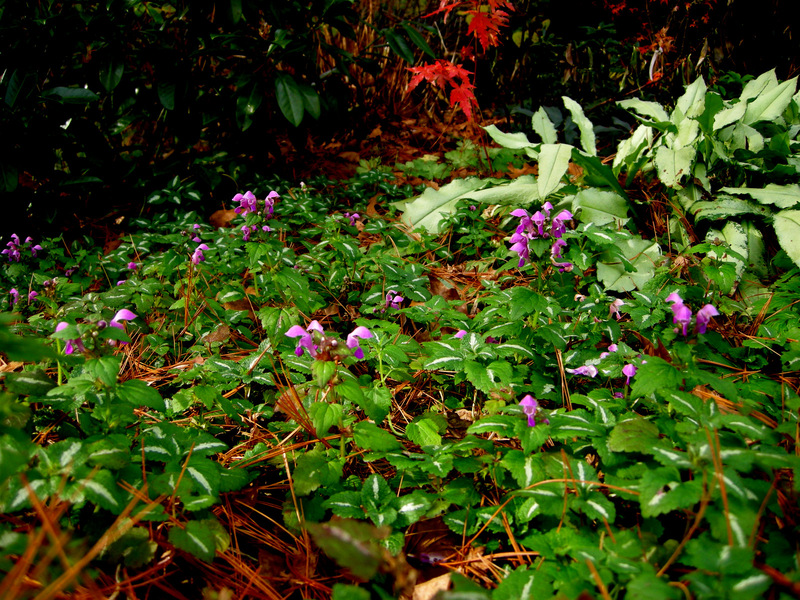 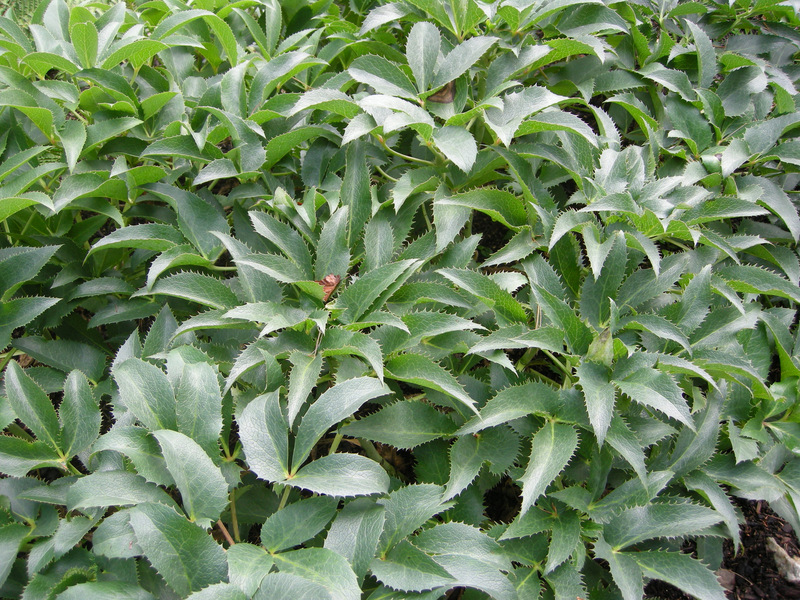 For more on lamium as a wintergreen groundcover, click here. 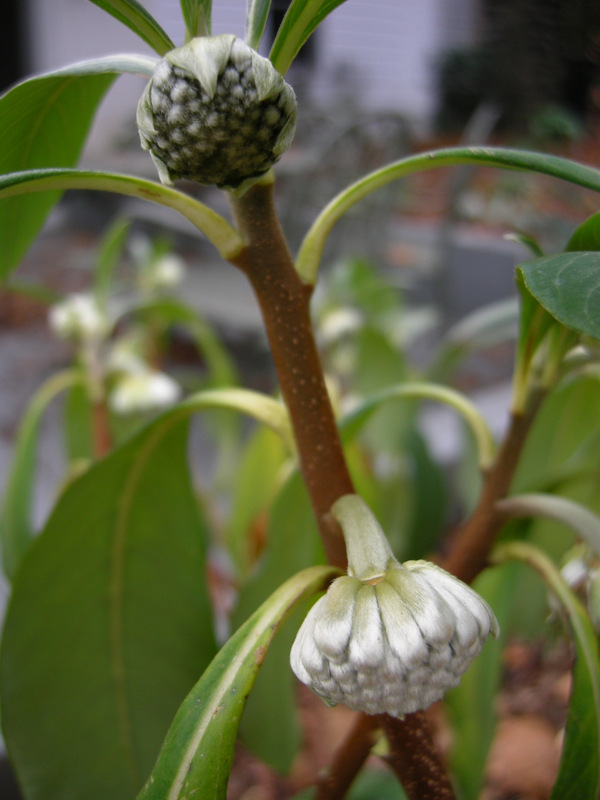 The buds on my paperbush, Edgeworthia chrysantha, have gotten large enough to show their beautiful silvery color and will remain ornamental until they start to open in March. 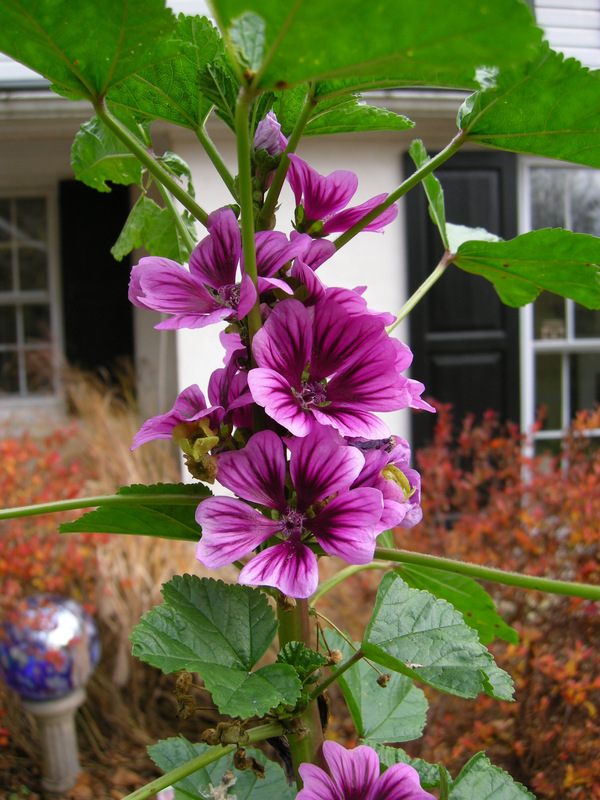 ‘Zebrina’ hollyhock mallow, Malva sylvestris ‘Zebrina’, does not seem to be bothered by hard frosts. 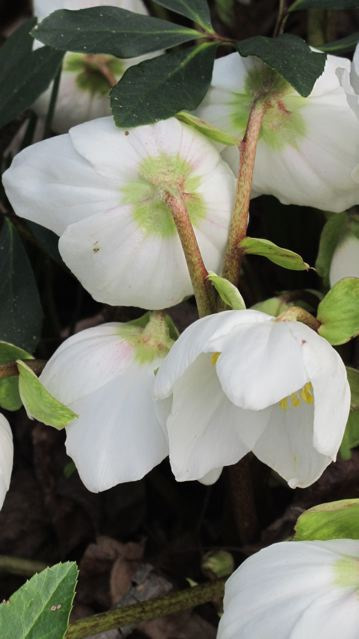 The spent flower heads of ‘Josef Lemper’ Christmas rose, Helleborus niger ‘Josef Lemper’, which has been blooming since early October, seem more ornamental when everything else has gone by. 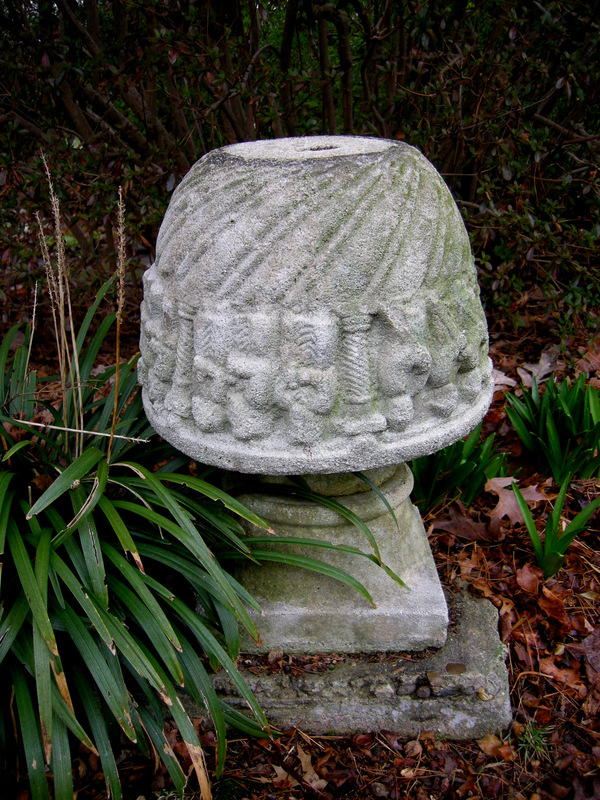 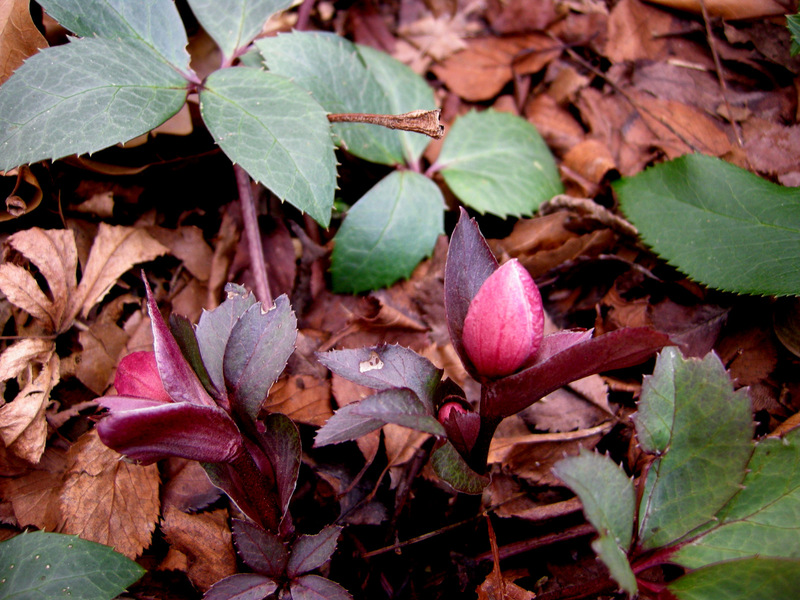 Buds are forming at the base for the next wave of bloom. 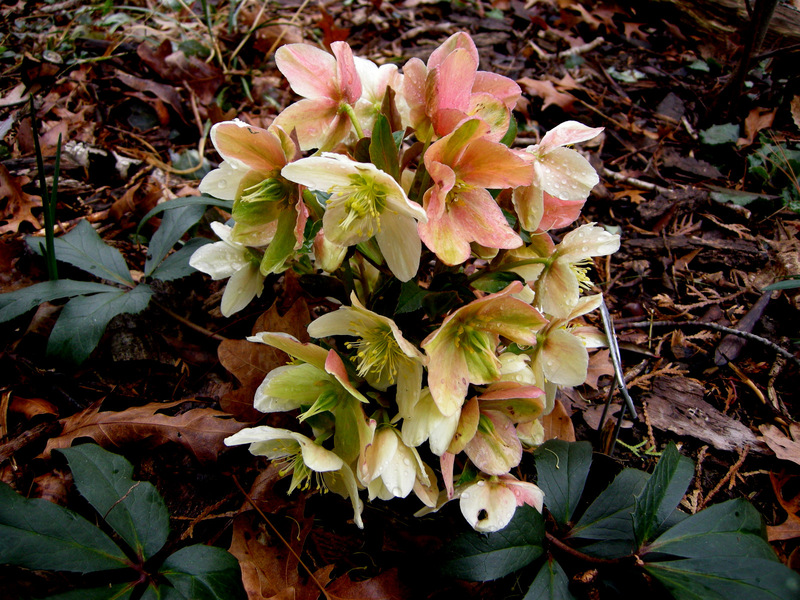 Since November 15, another Helleborus dumetorum (no common name) has put out fresh foliage and covered itself in flowers. 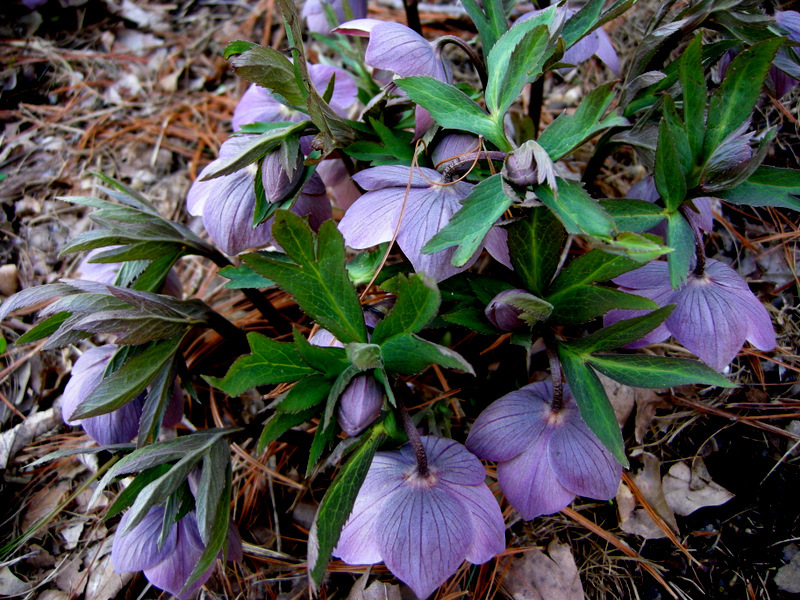 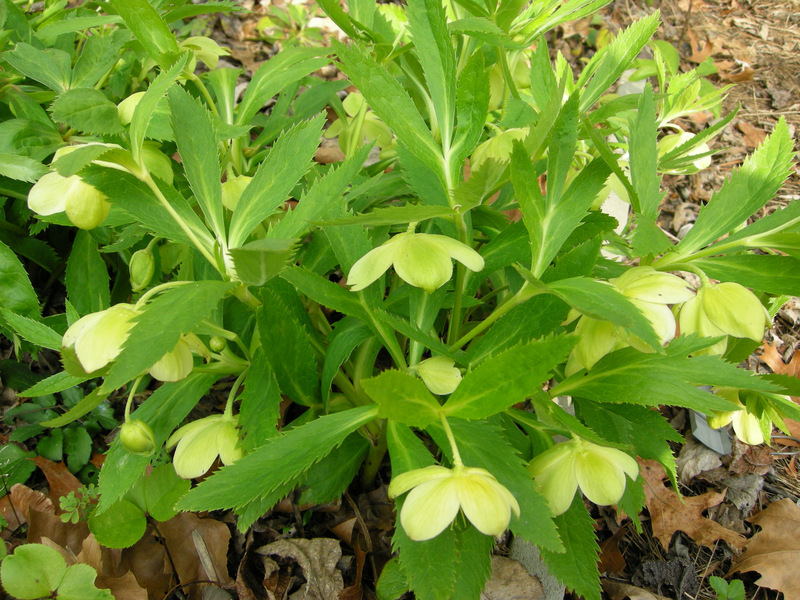 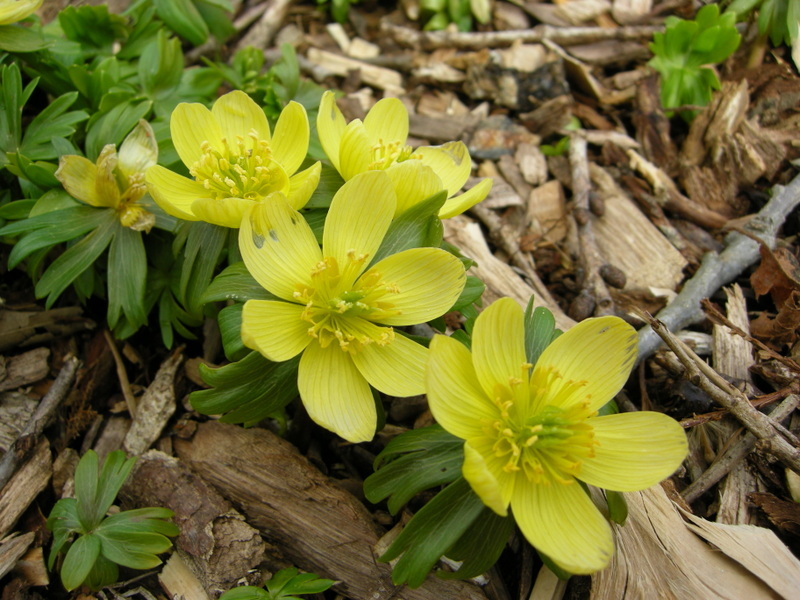 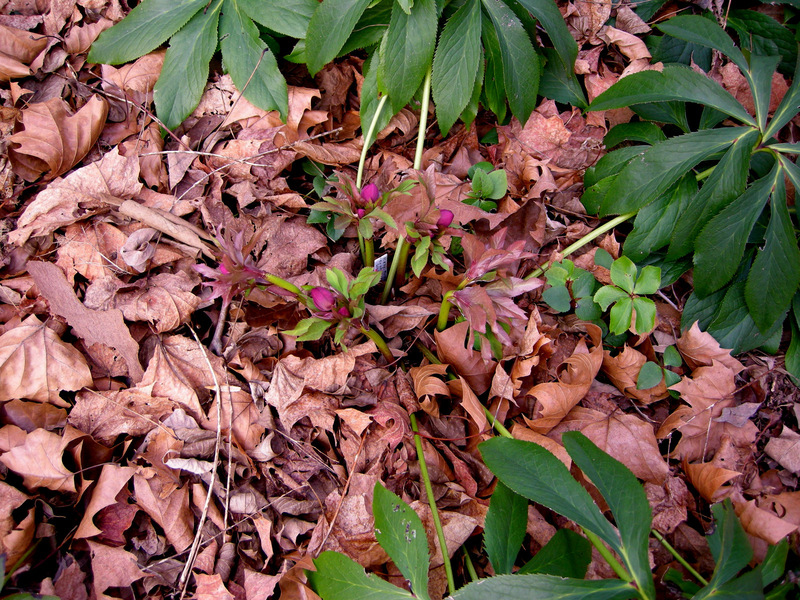 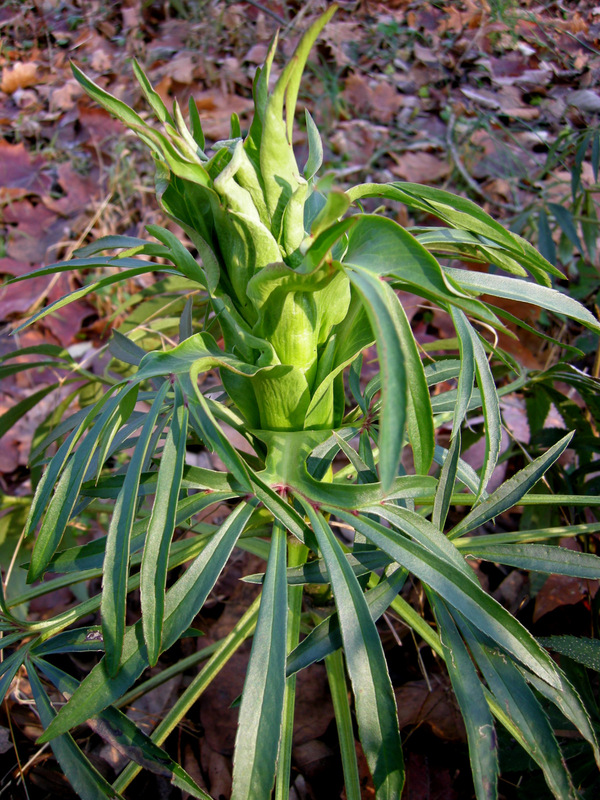 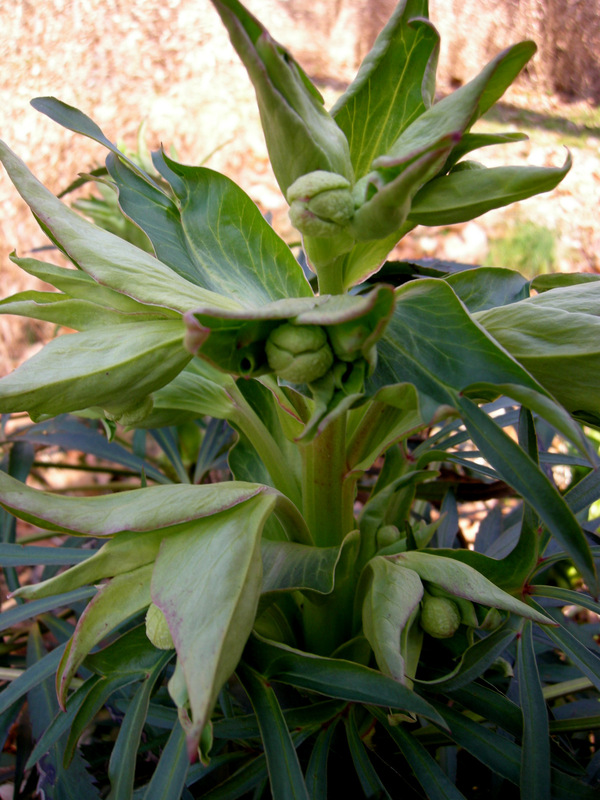 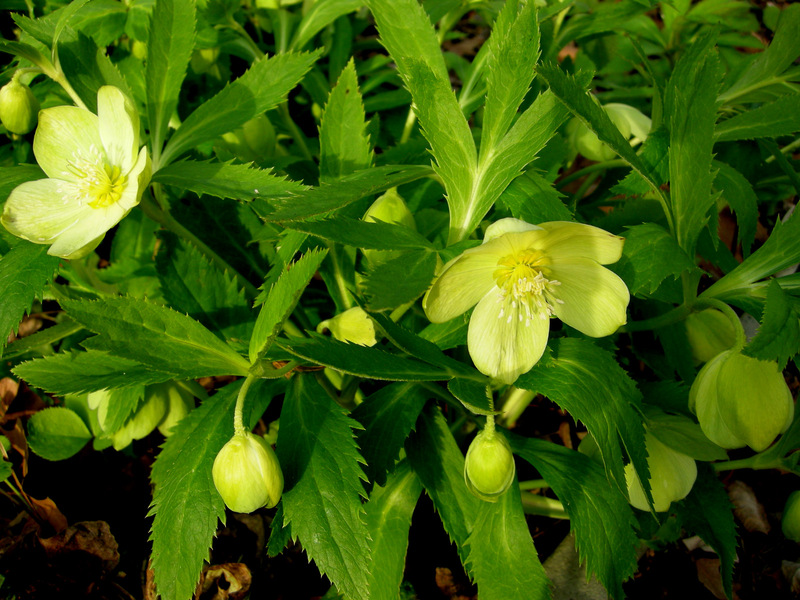 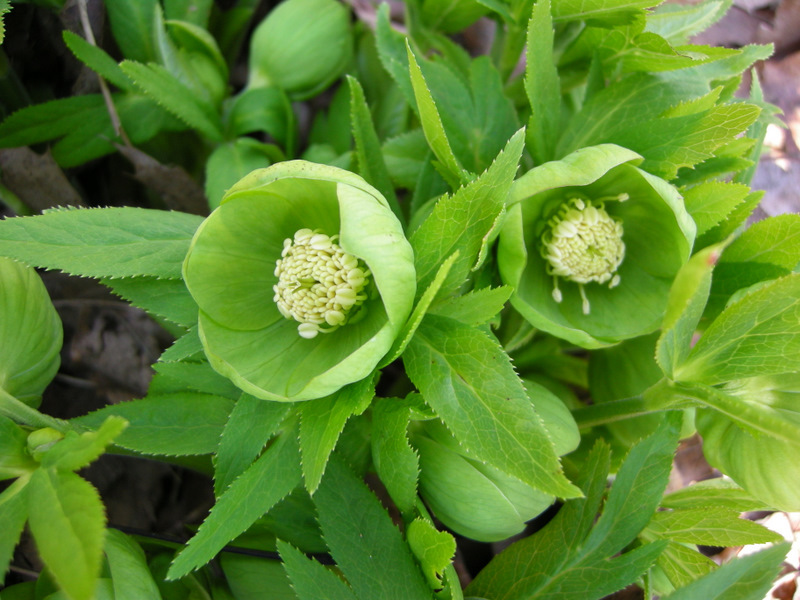 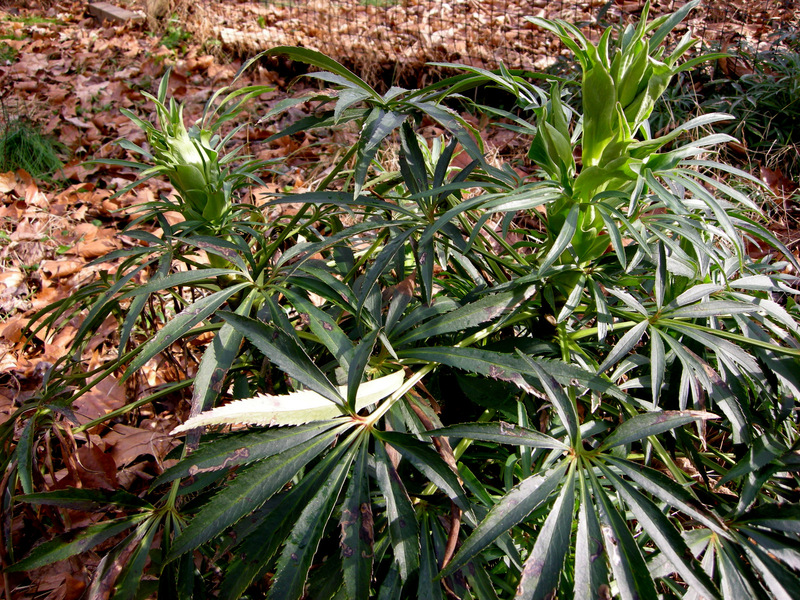 The lighter chartreuse buds are forming on bearsfoot hellebore, H. foetidus, which will remain ornamental through May. 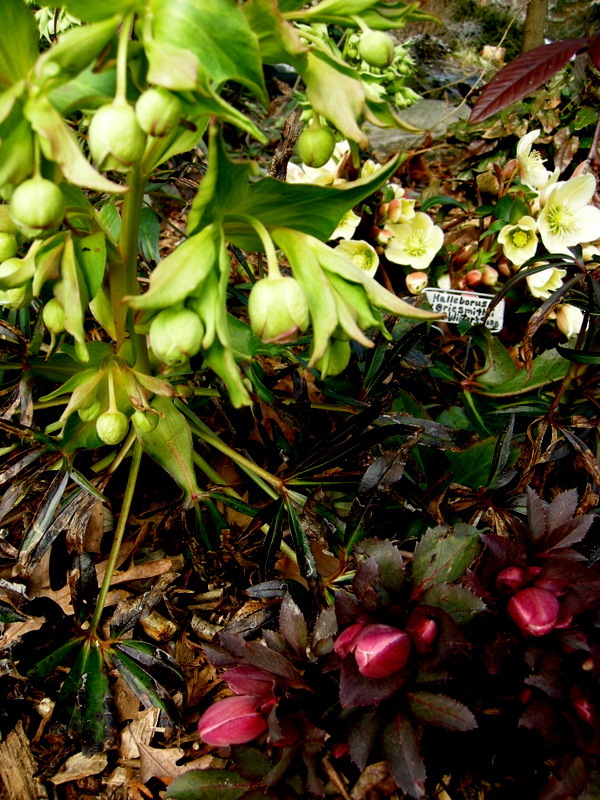 ‘Jacob’ Christmas rose, Helleborus niger ‘Jacob’, is covered with buds just starting to open. 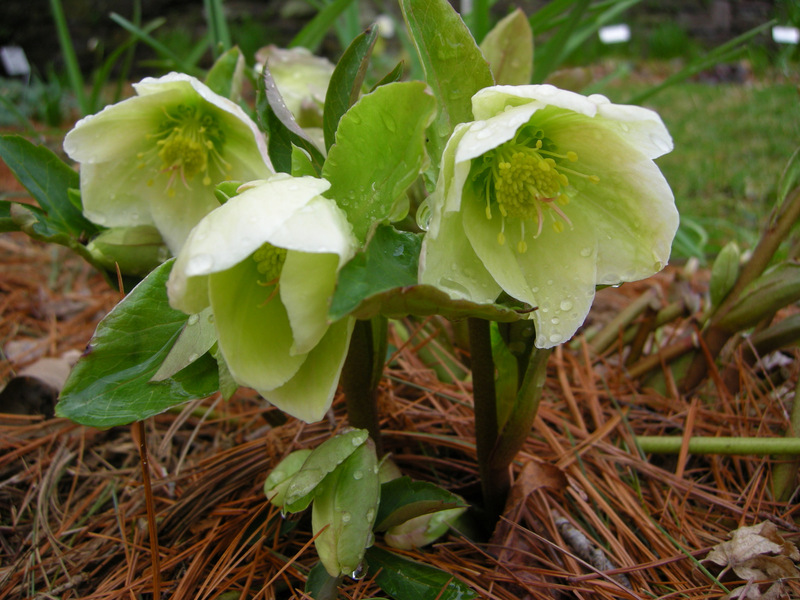 This photo might not look very exciting, but I am thrilled to see buds on my rare double Christmas rose, Helleborus niger ‘Double Fantasy’. 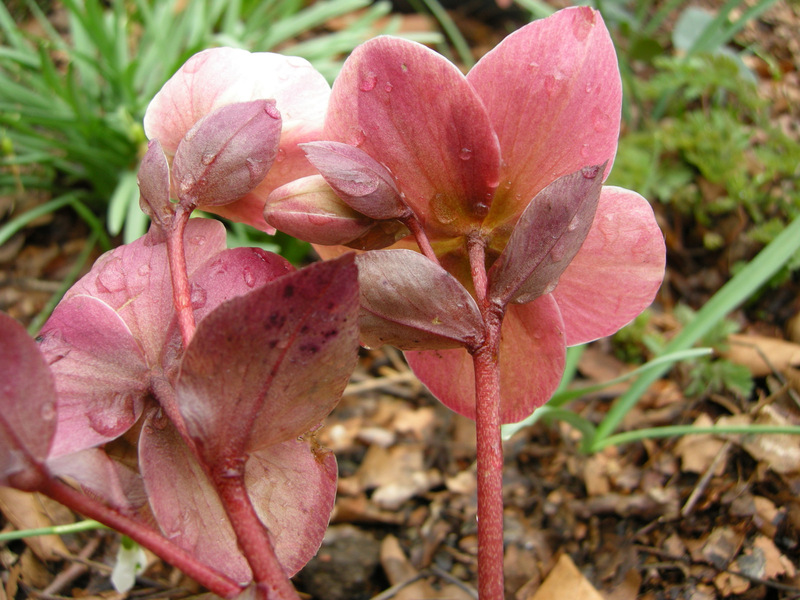 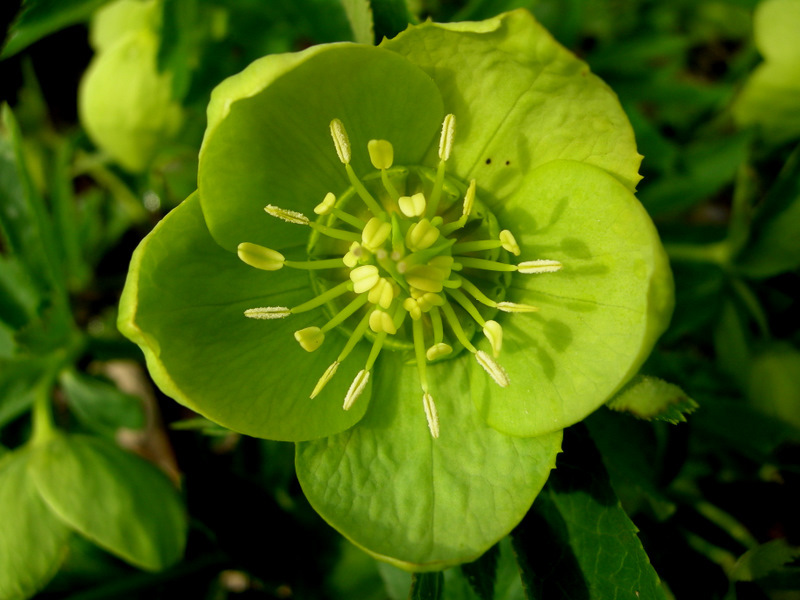 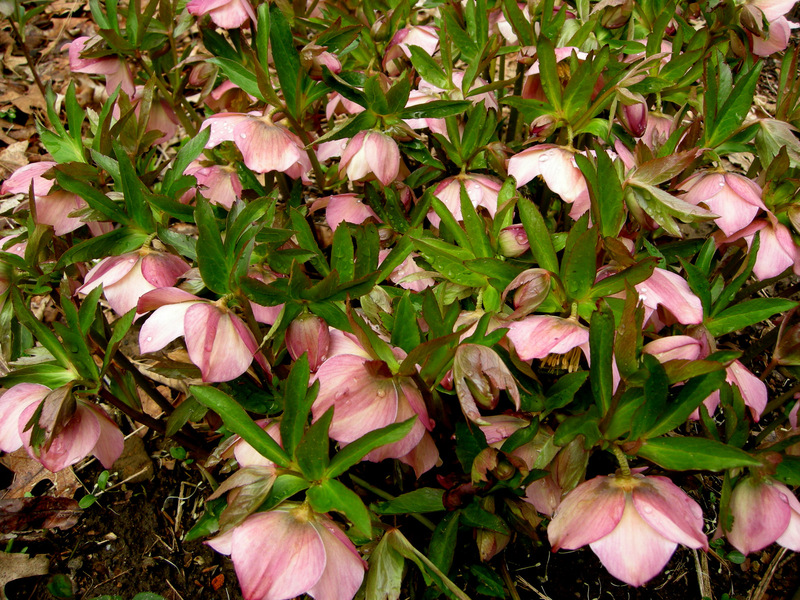 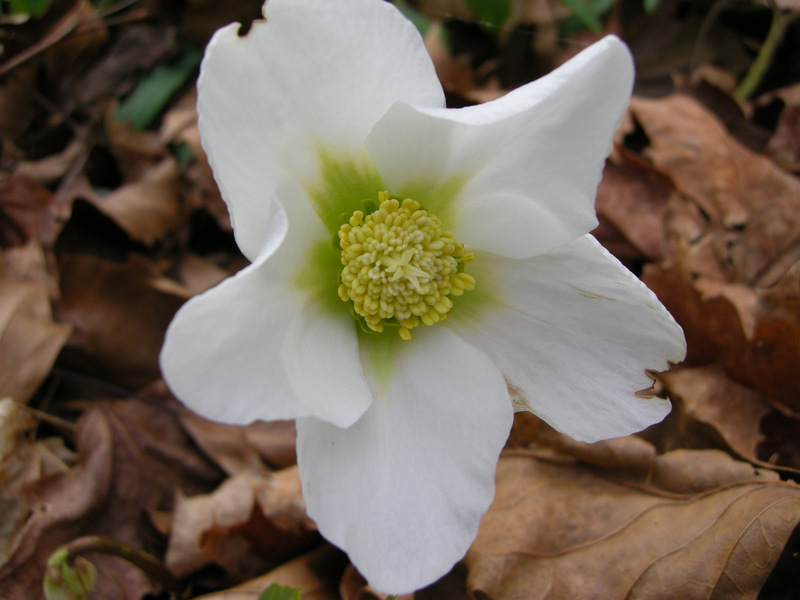 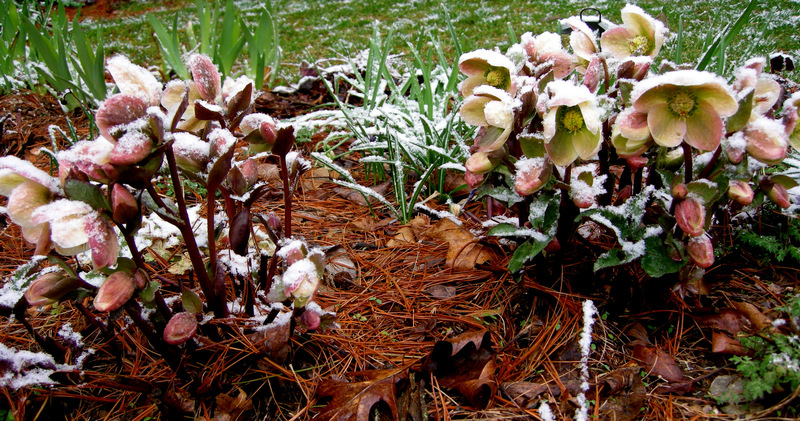 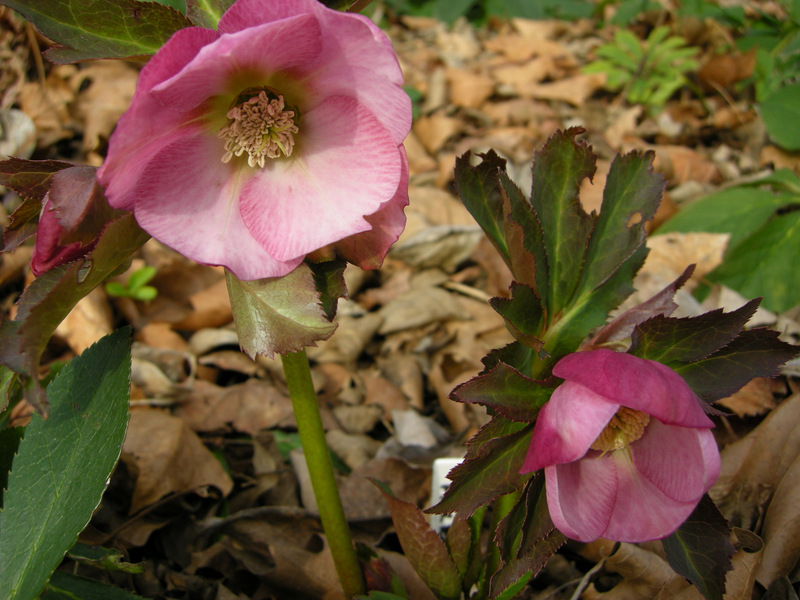 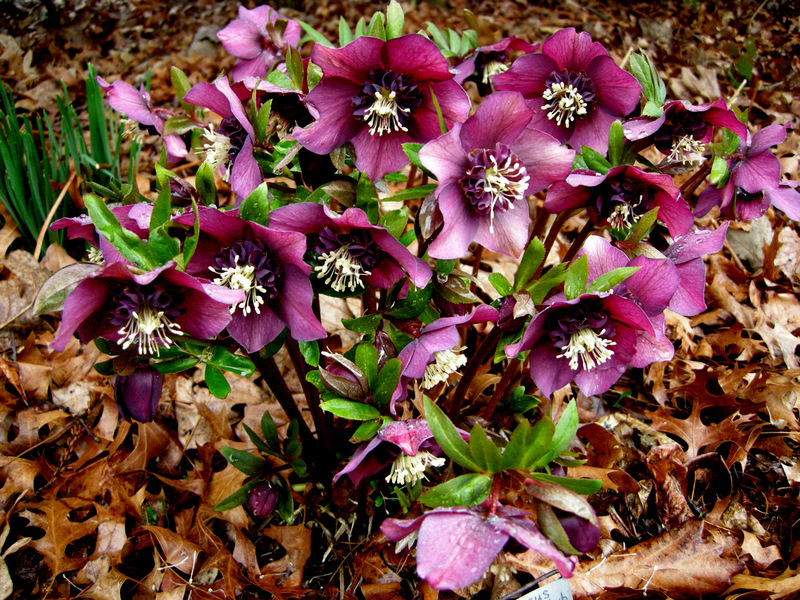 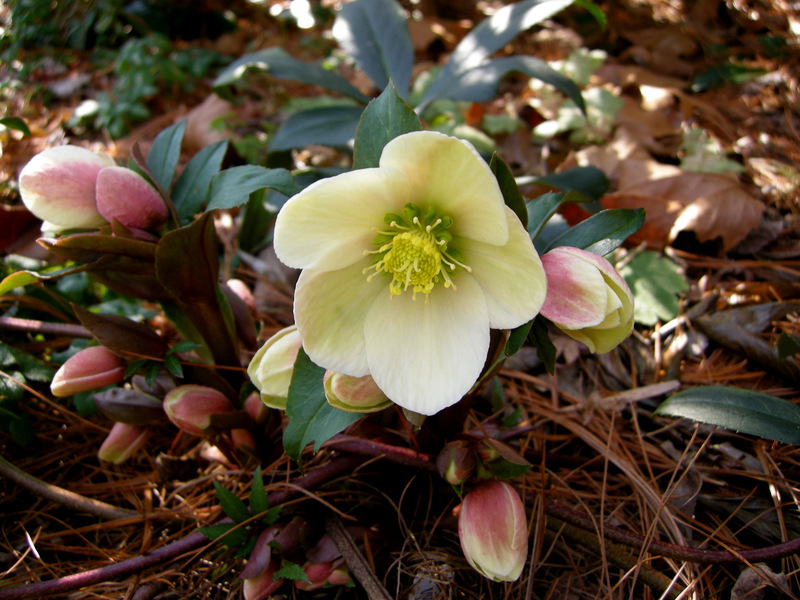 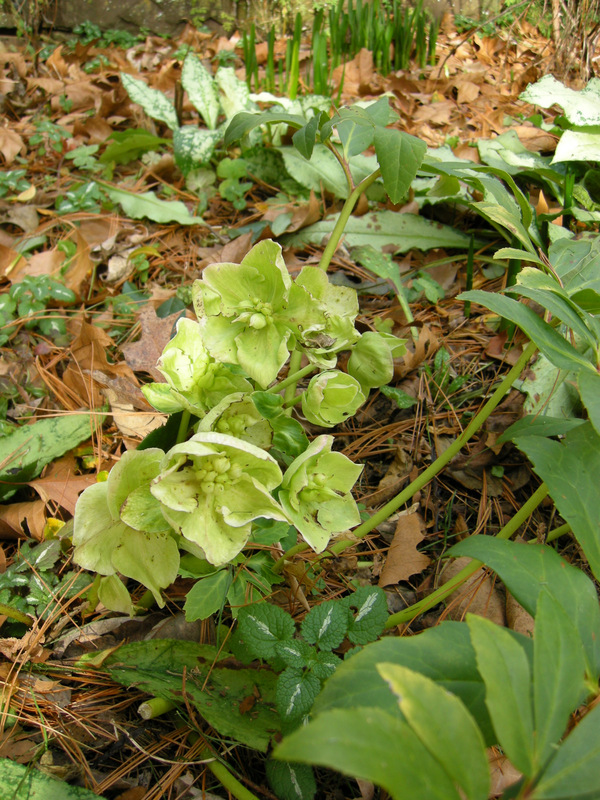 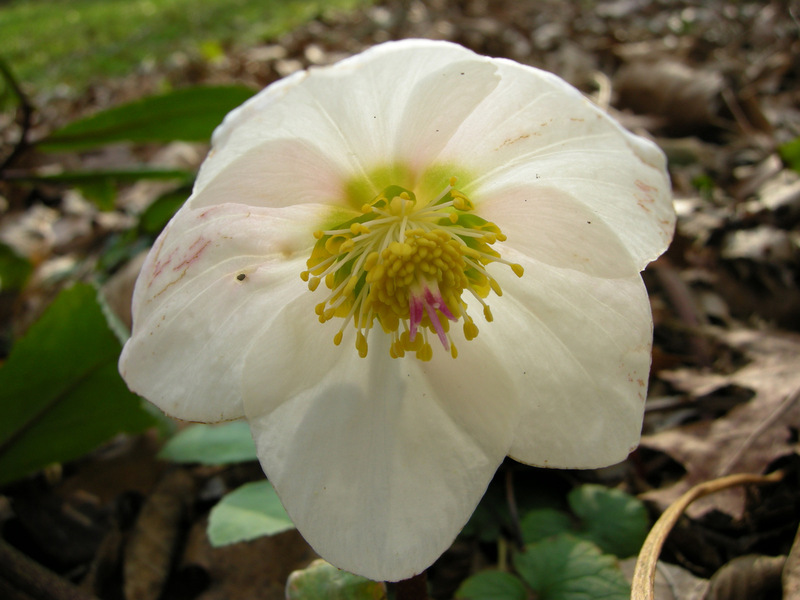 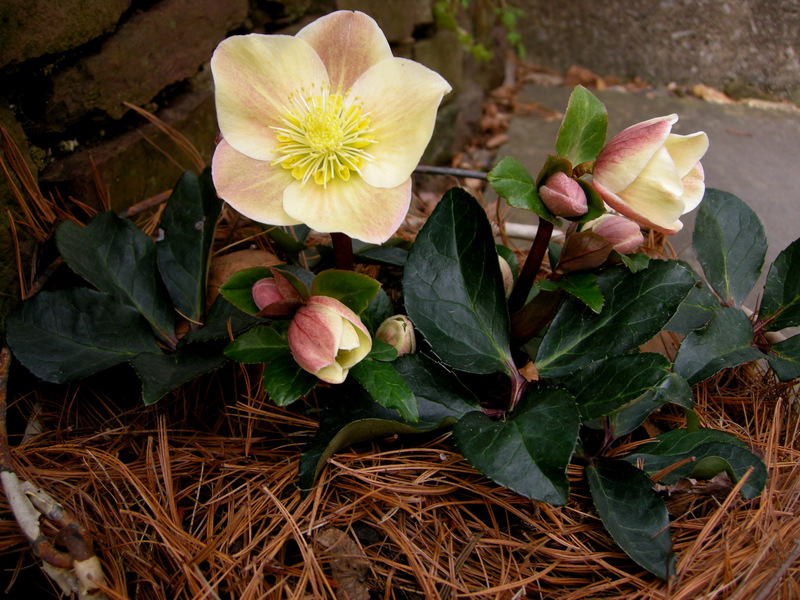 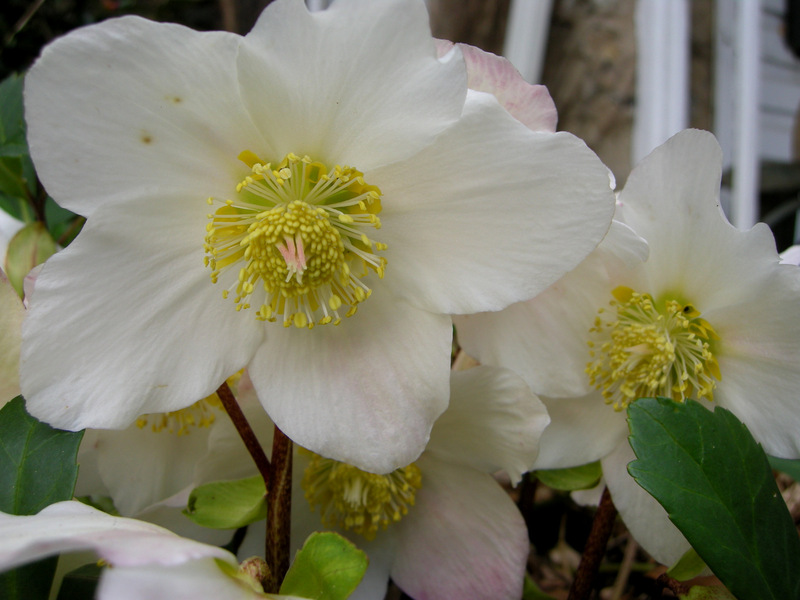 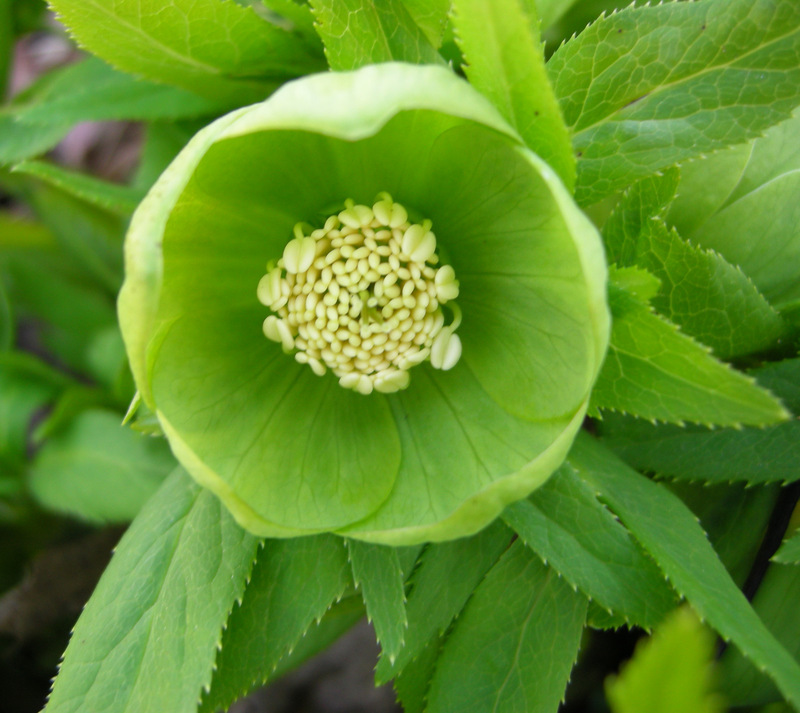 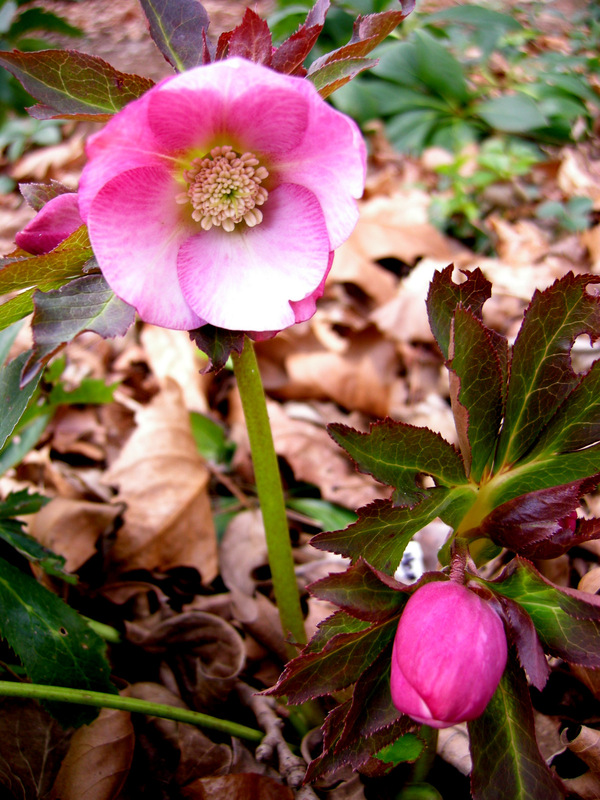 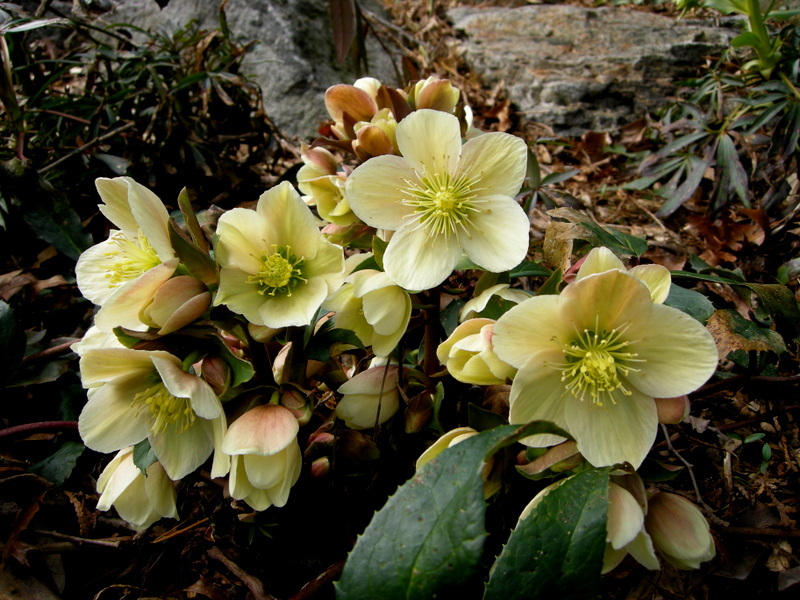 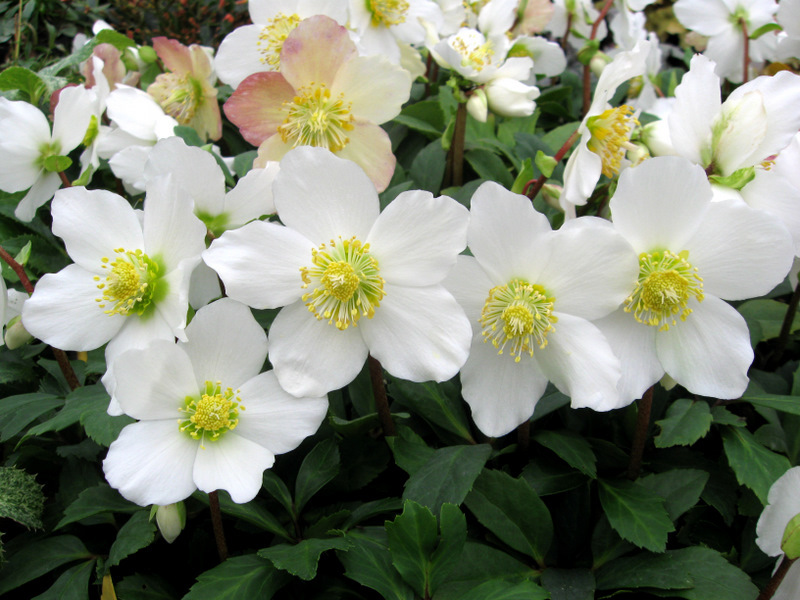 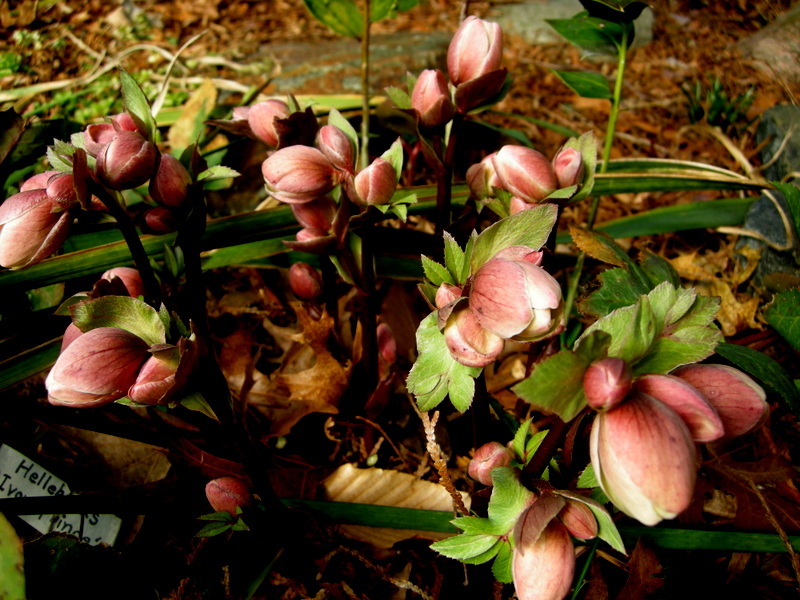 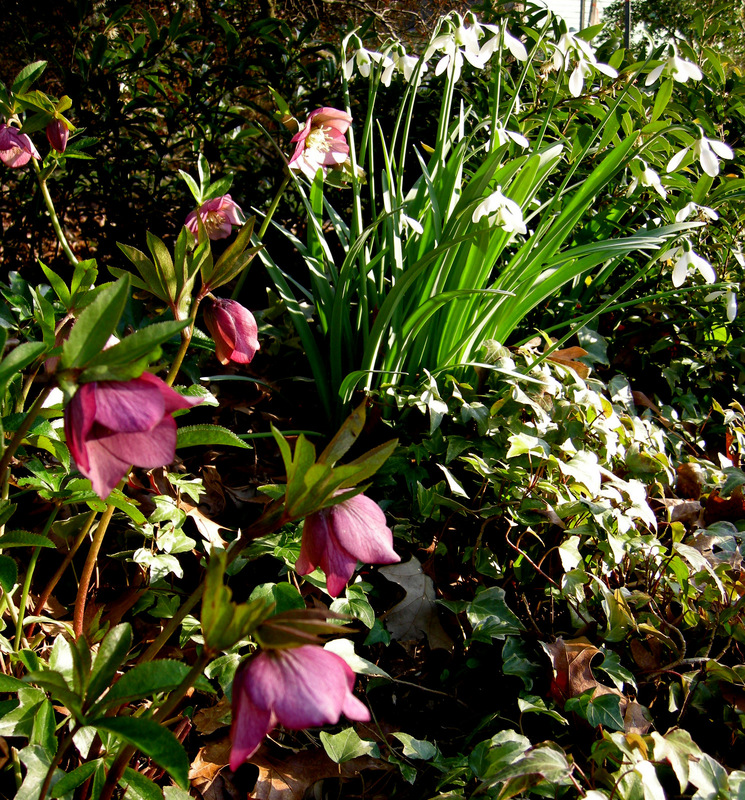 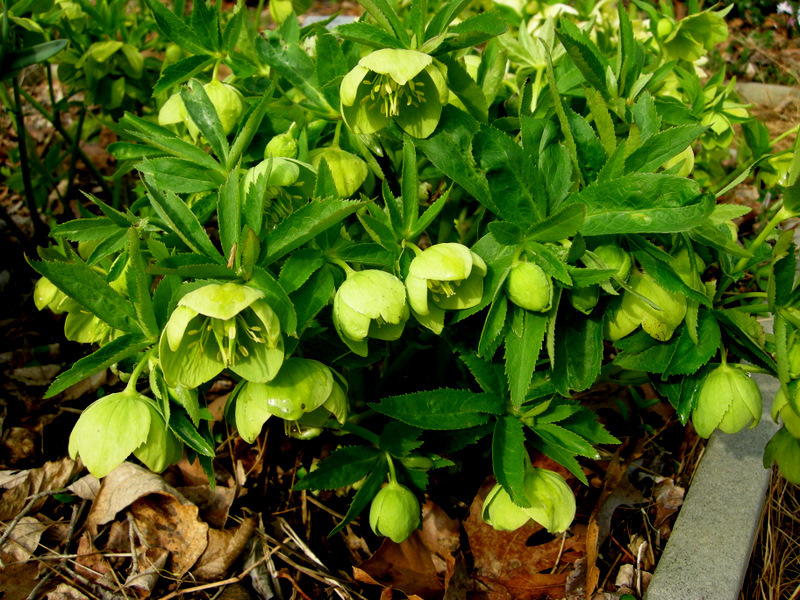 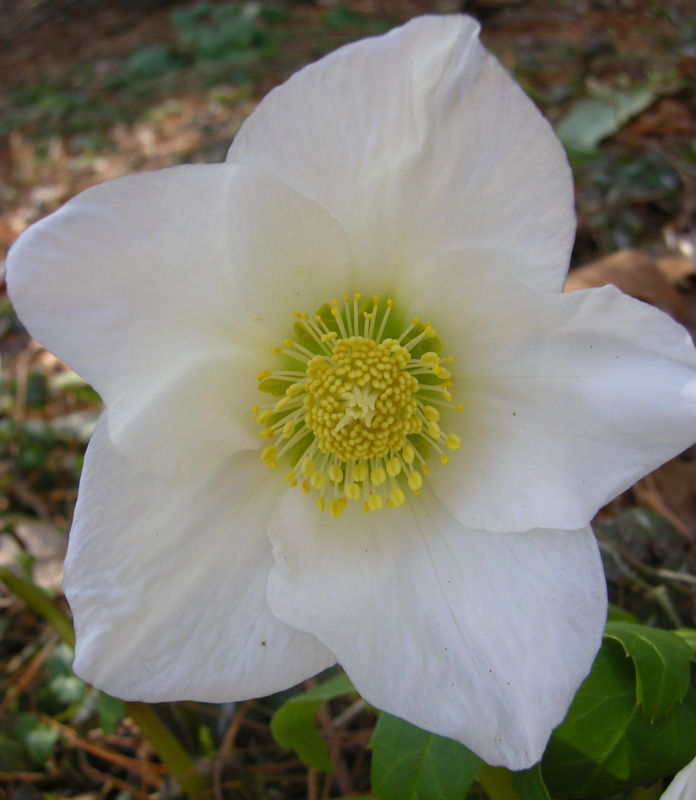 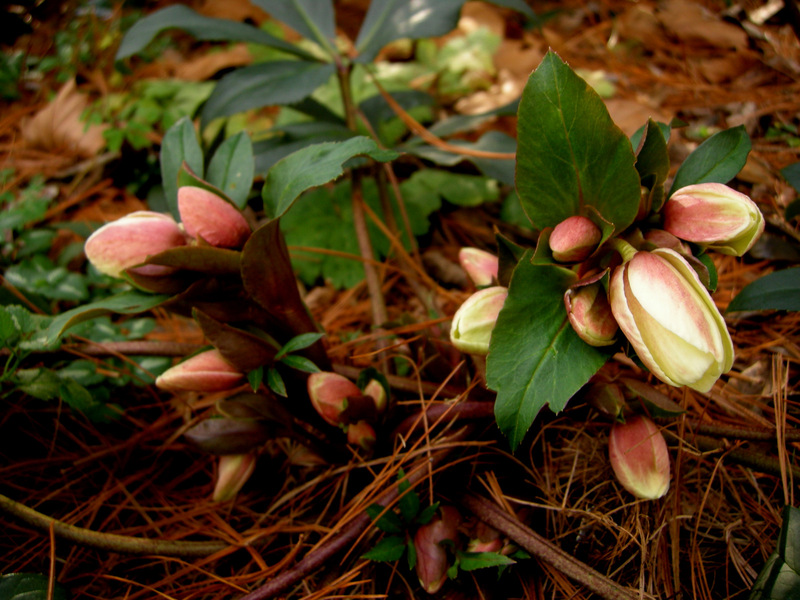 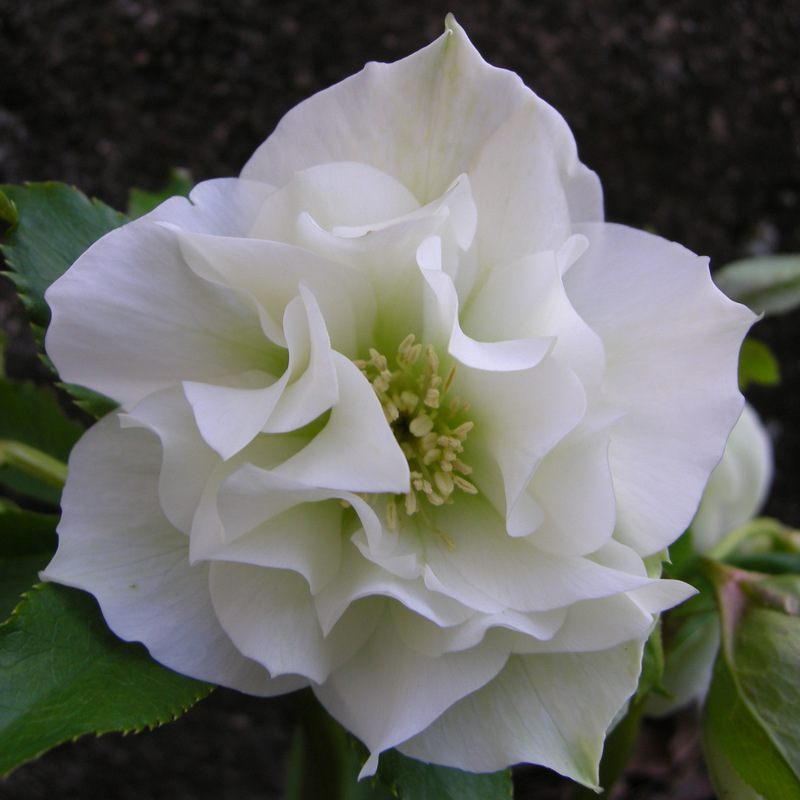 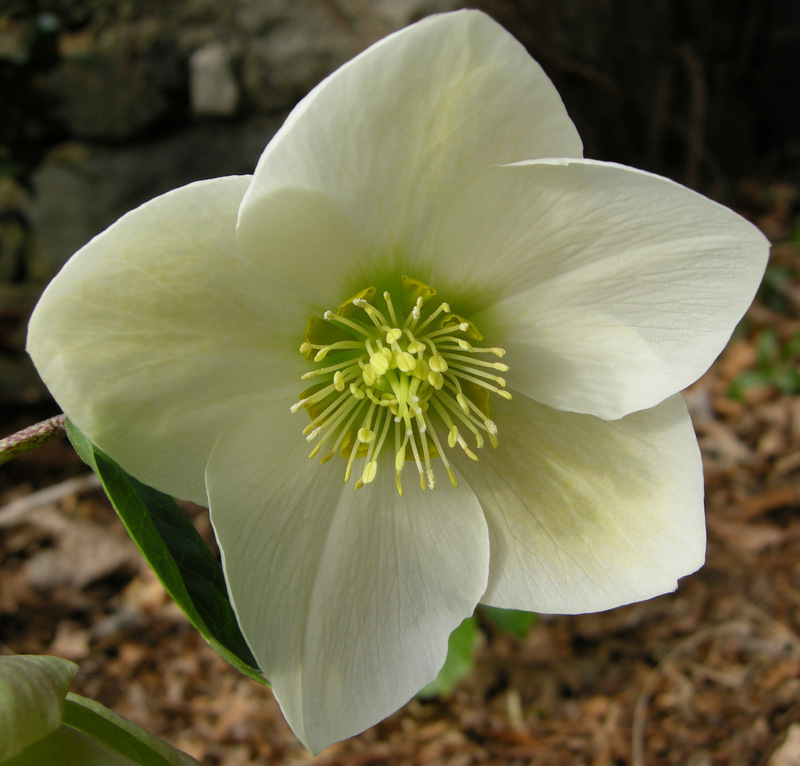 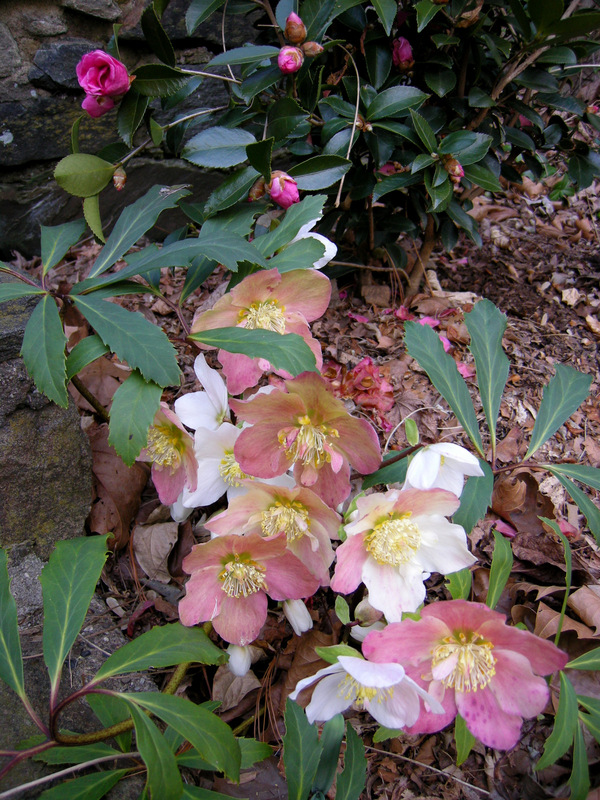 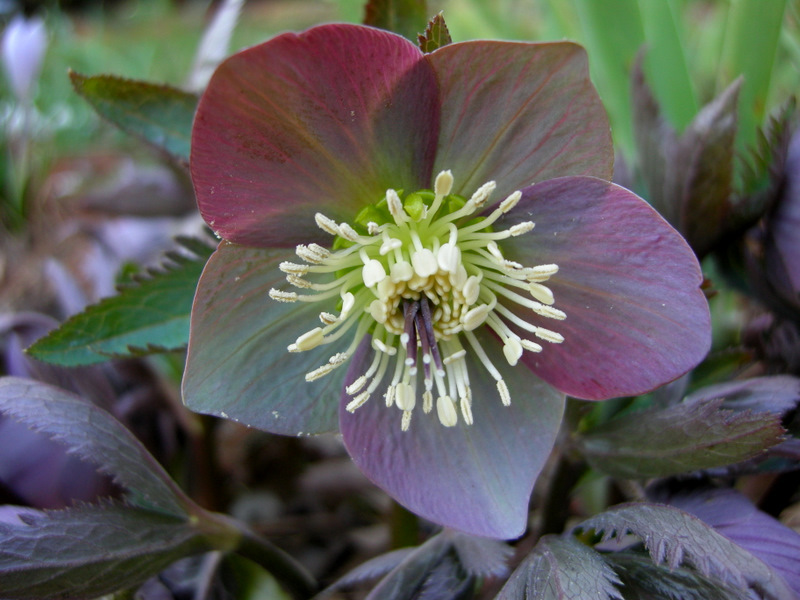 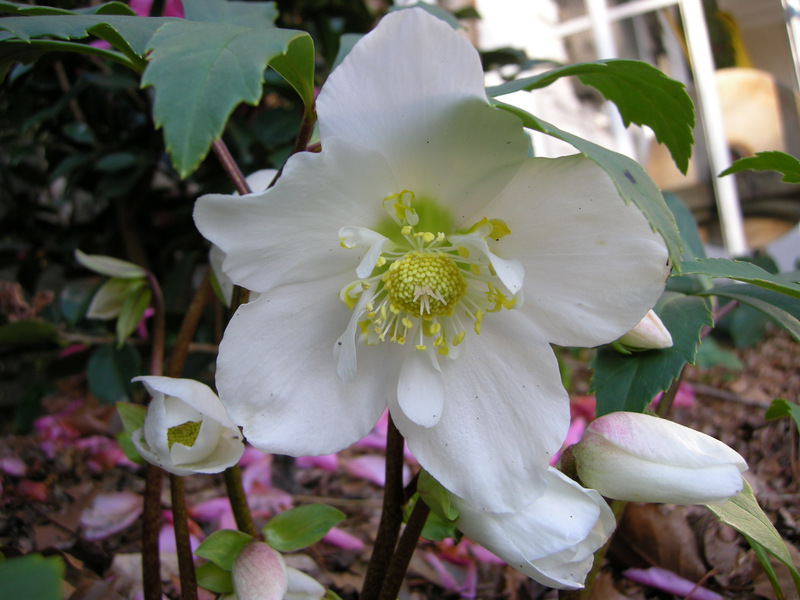 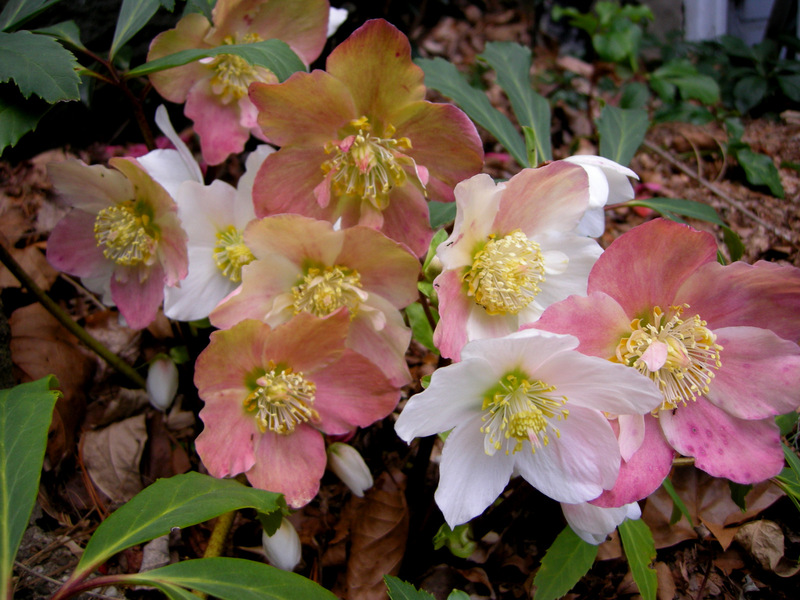 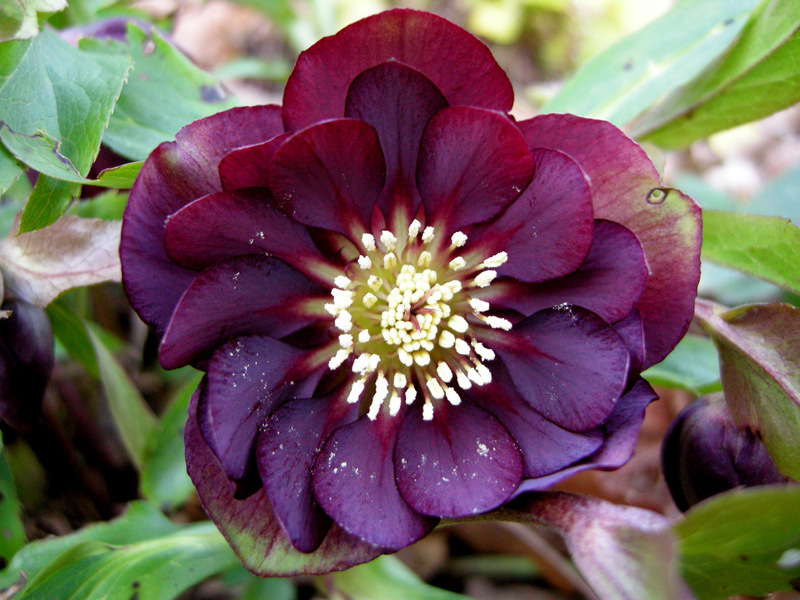 In all my years of collecting hellebores, I have only seen a double Christmas rose once in a garden. 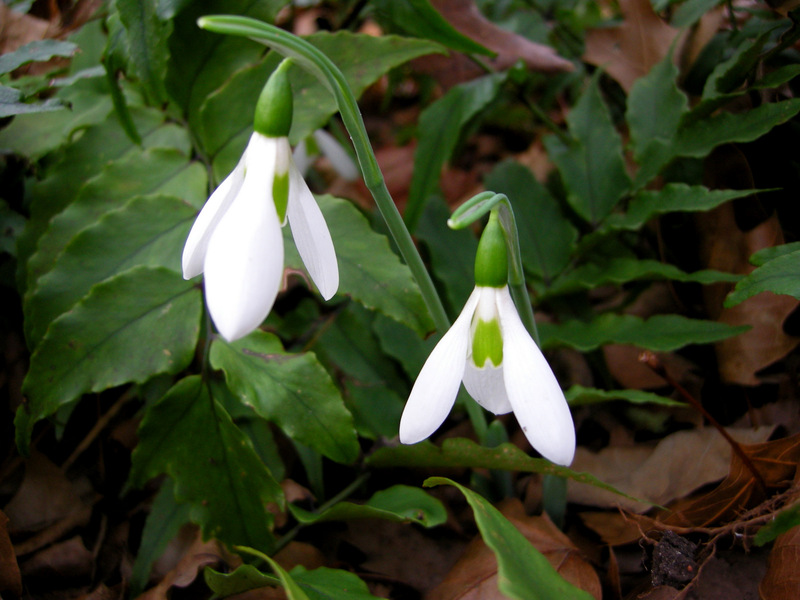 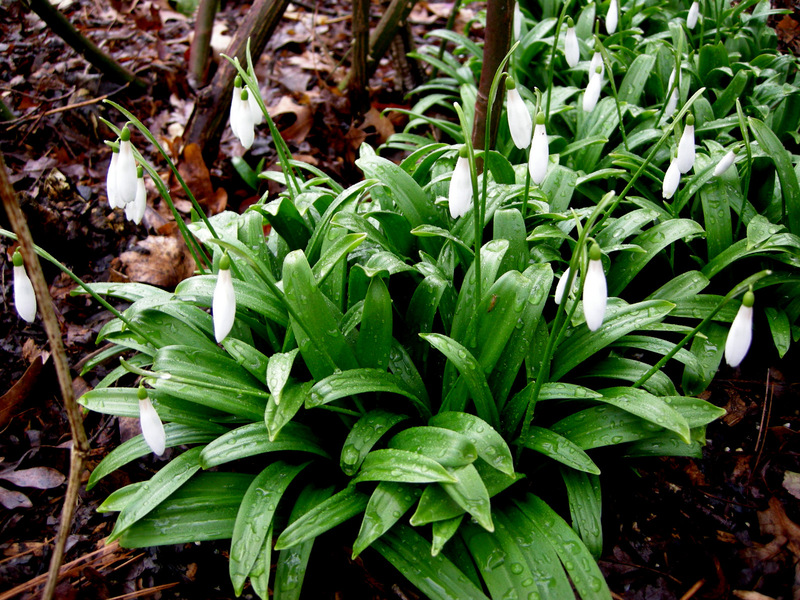 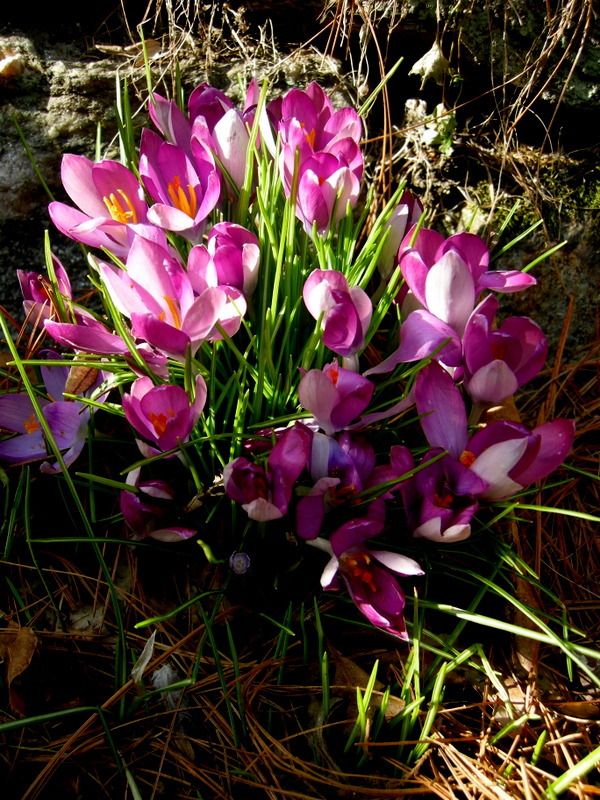 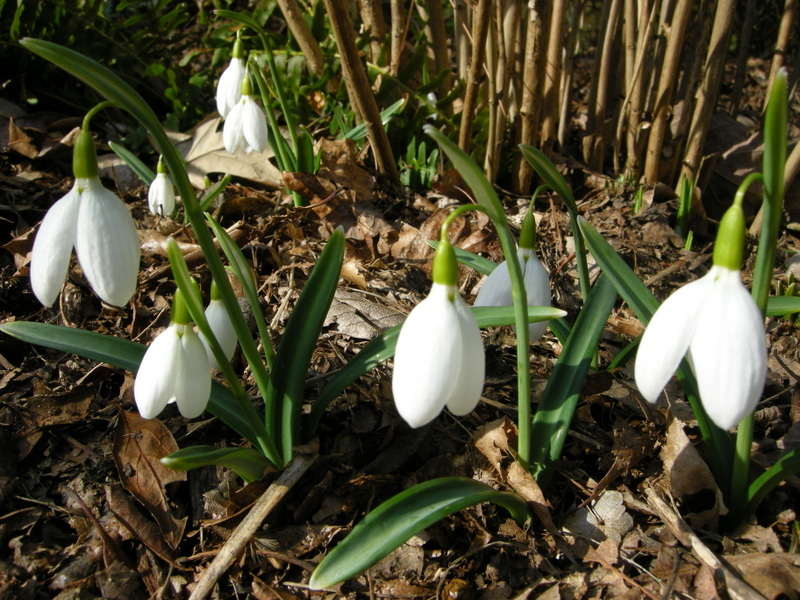 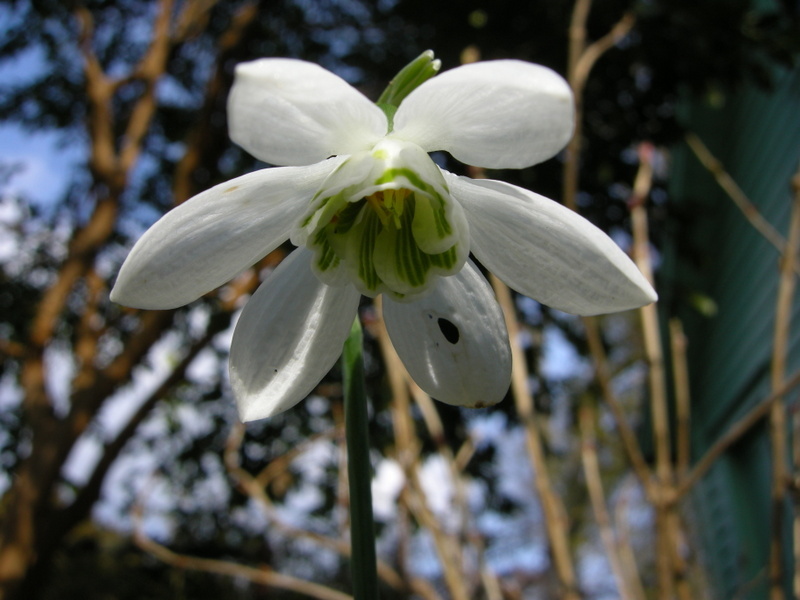 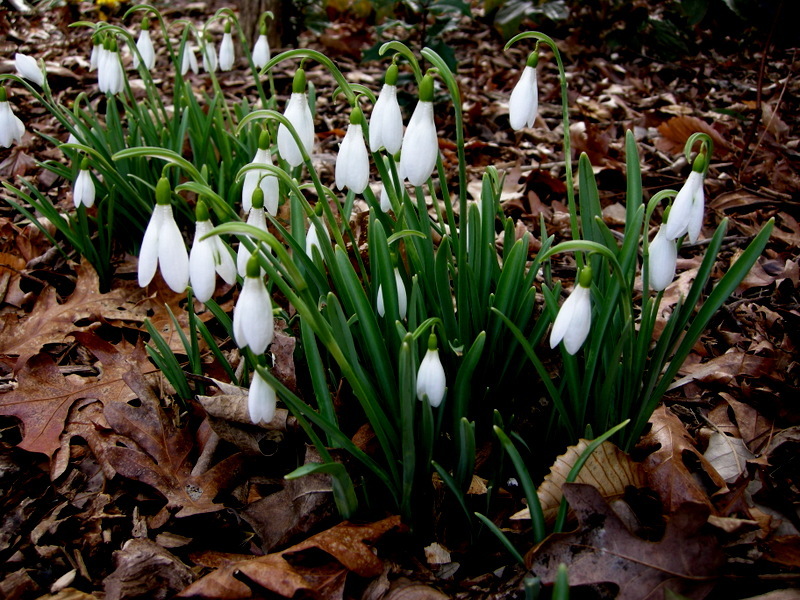 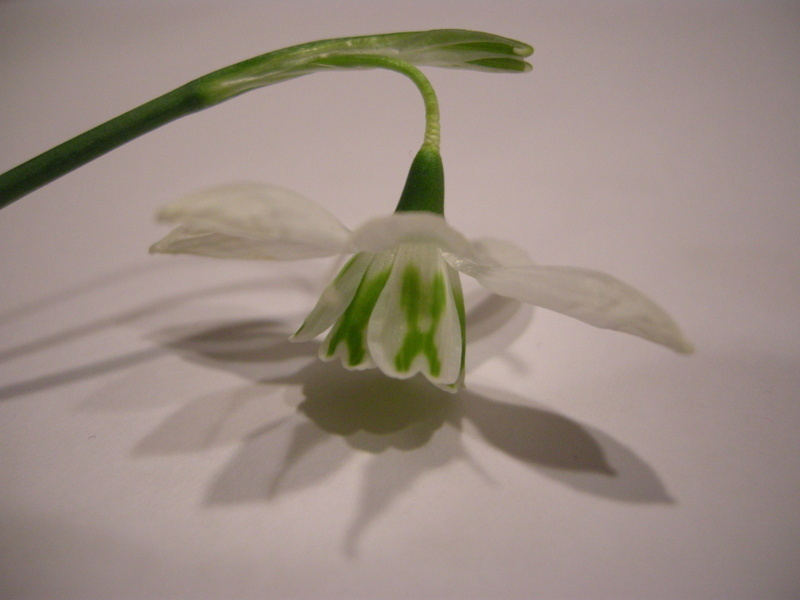 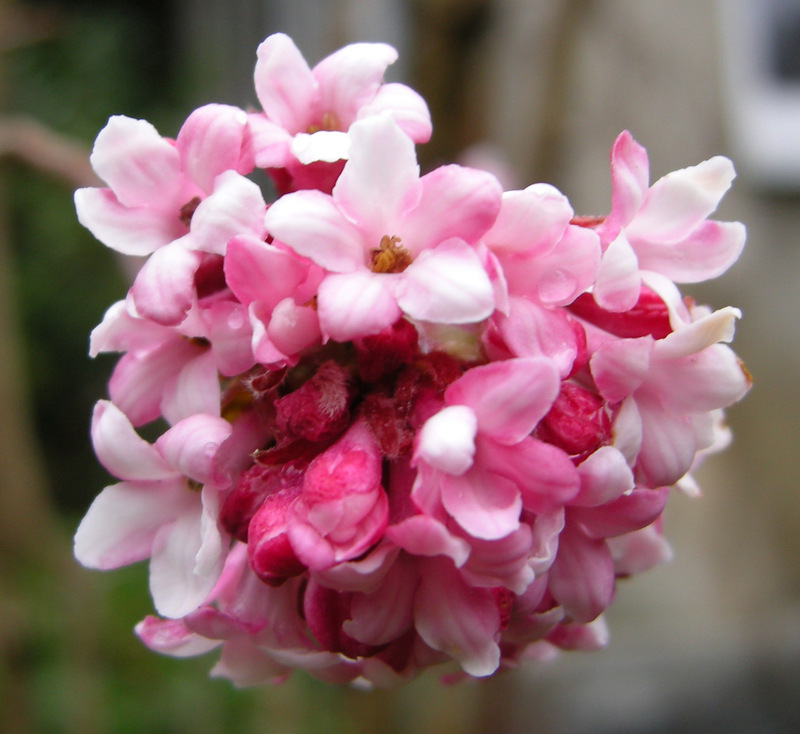 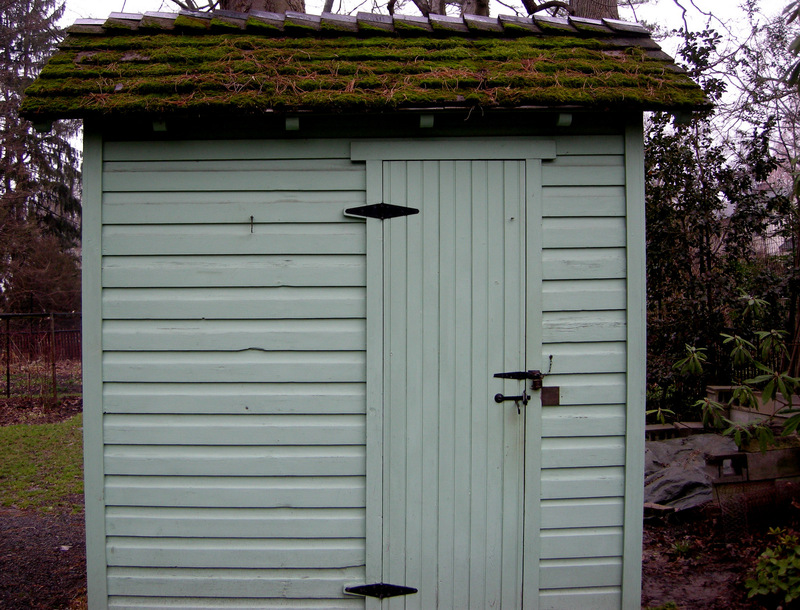 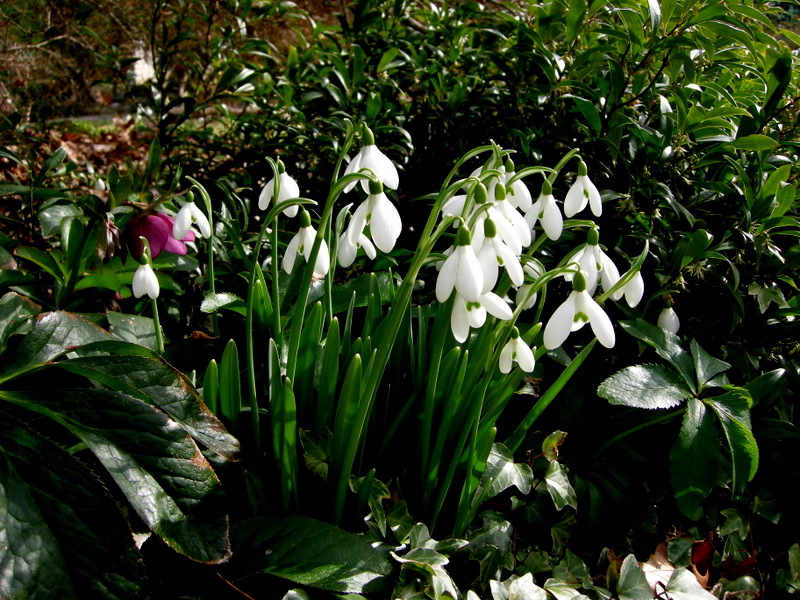 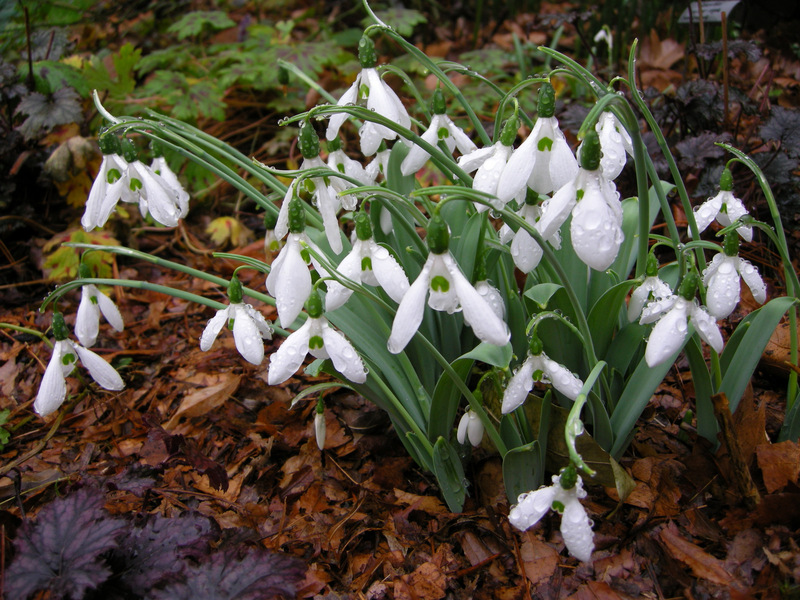 Now I will be offering blooming plants to my customers in my 2012 snowdrop catalogue. 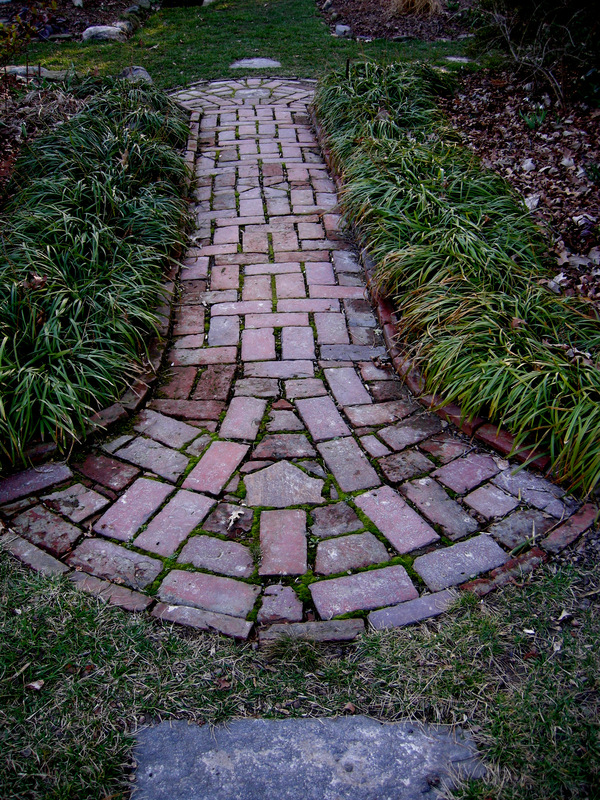 This is what ‘Double Fantasy’ will look like when it’s open. 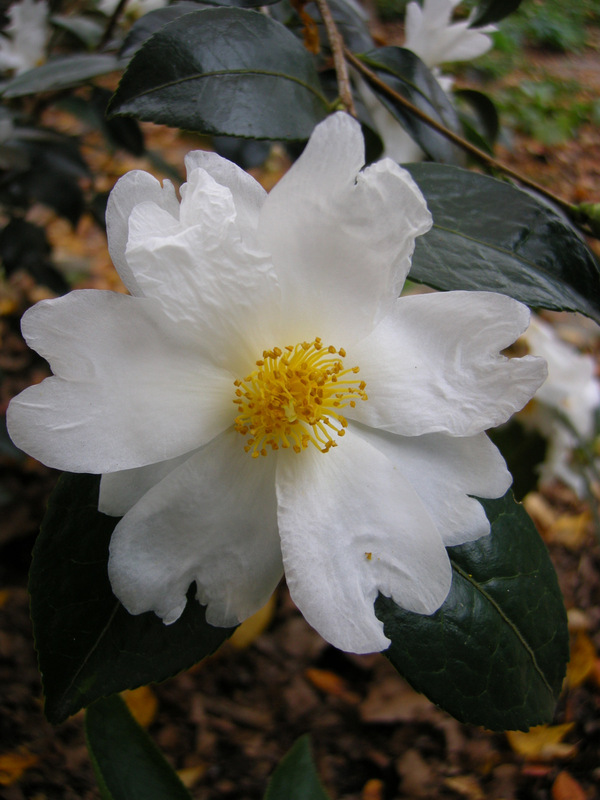 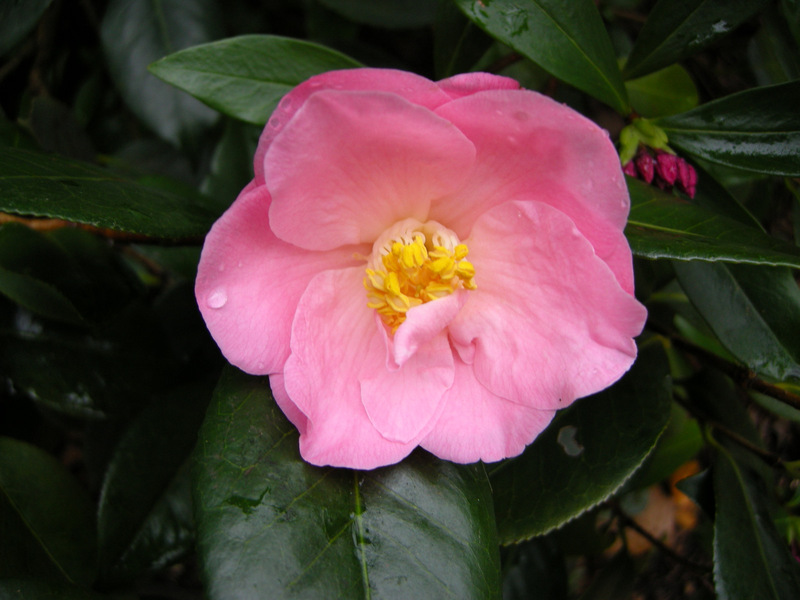 This is the last flower on Camellia x ‘Winter’s Darling’. 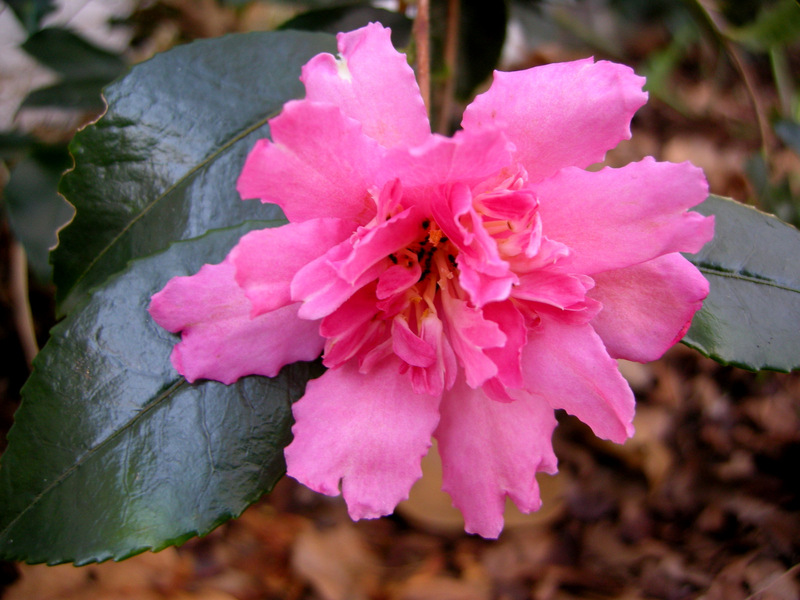 Camellia x ‘Elaine Lee’ still has a few buds left . 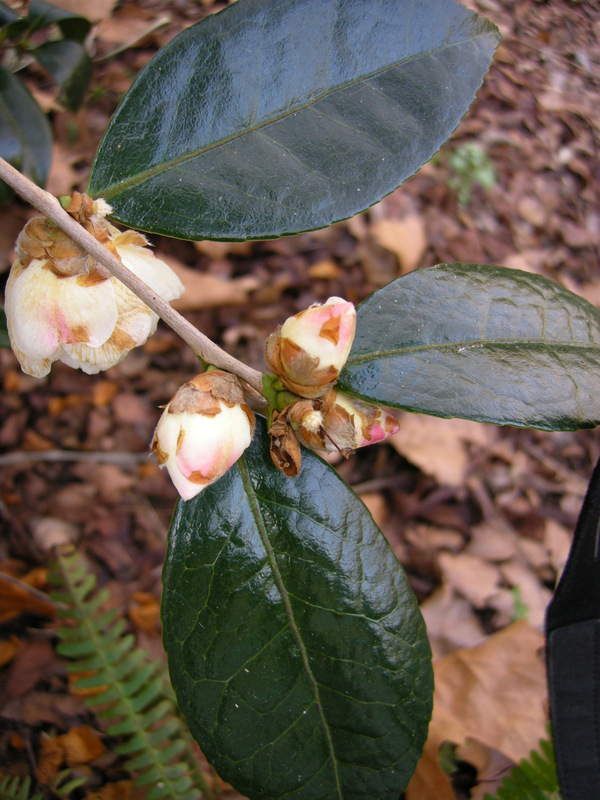 Camellia x ‘Winter’s Joy’ has been flowering since October and is still covered with buds. 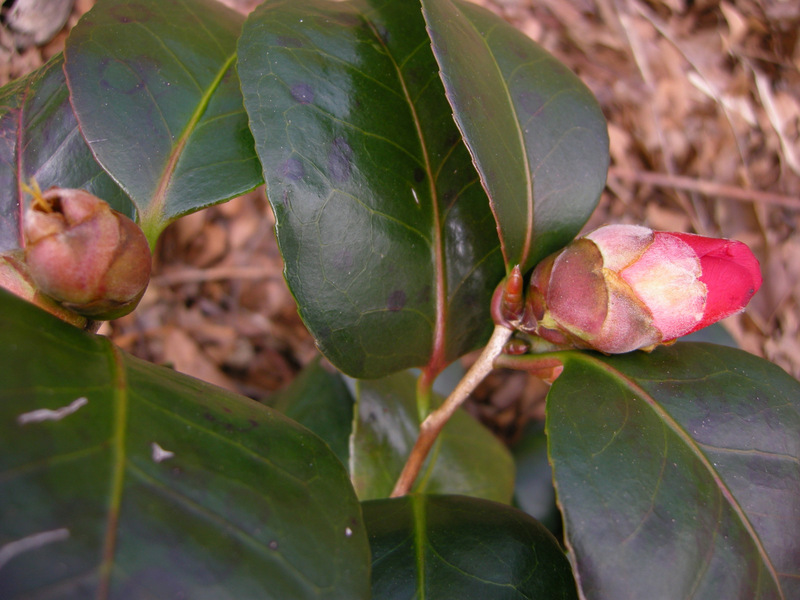 Fall-blooming Camellia oleifera is no longer covered with flowers but still continues to produce blooms when the weather warms up. 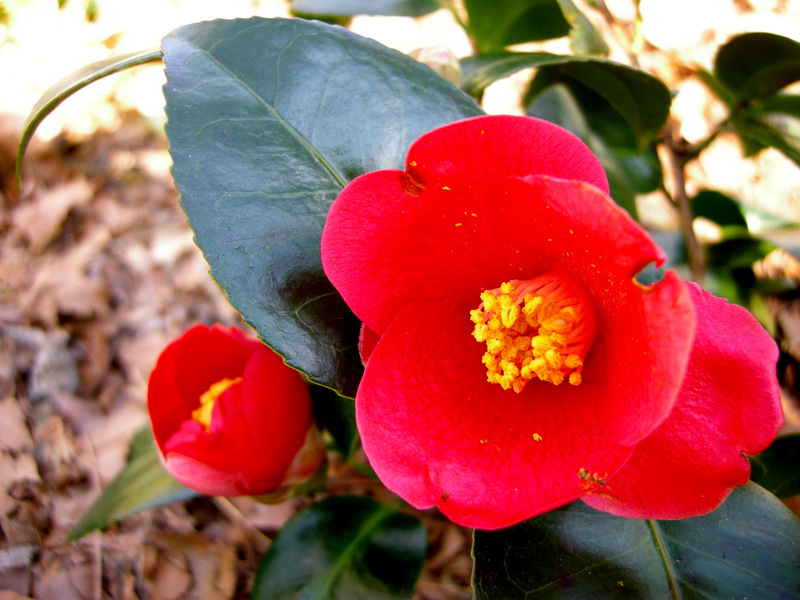 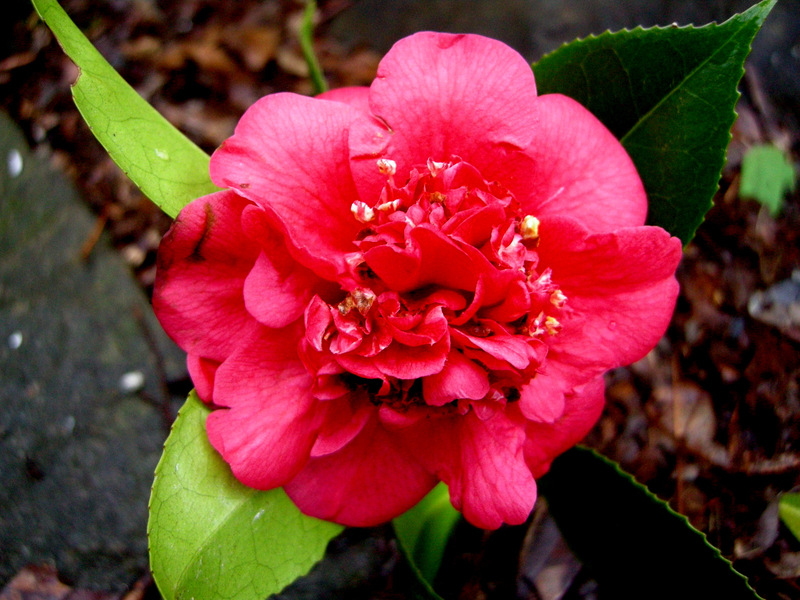 I was very lucky to receive as a gift this fully hardy, red-flowered Camellia japonica from Korea. 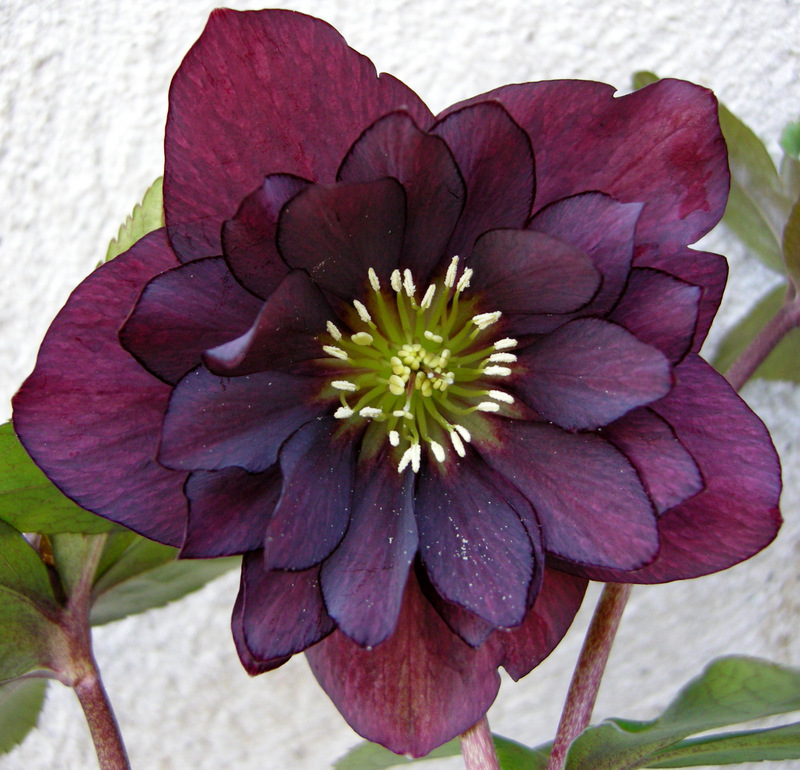 It has not yet been introduced for sale. 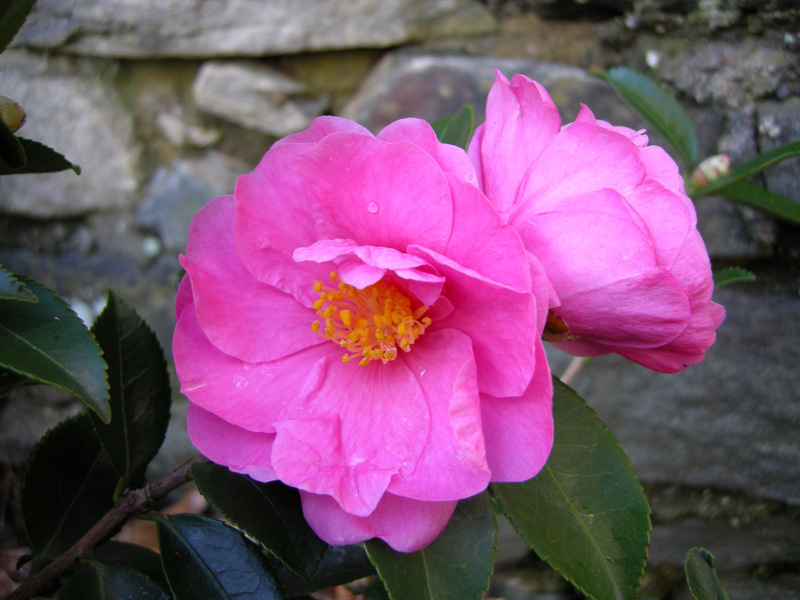 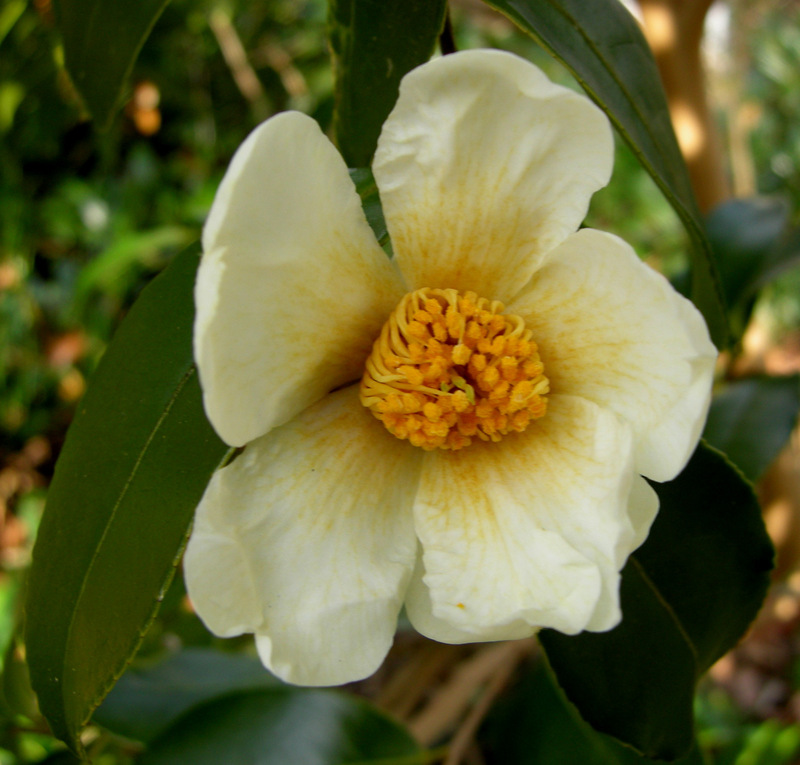 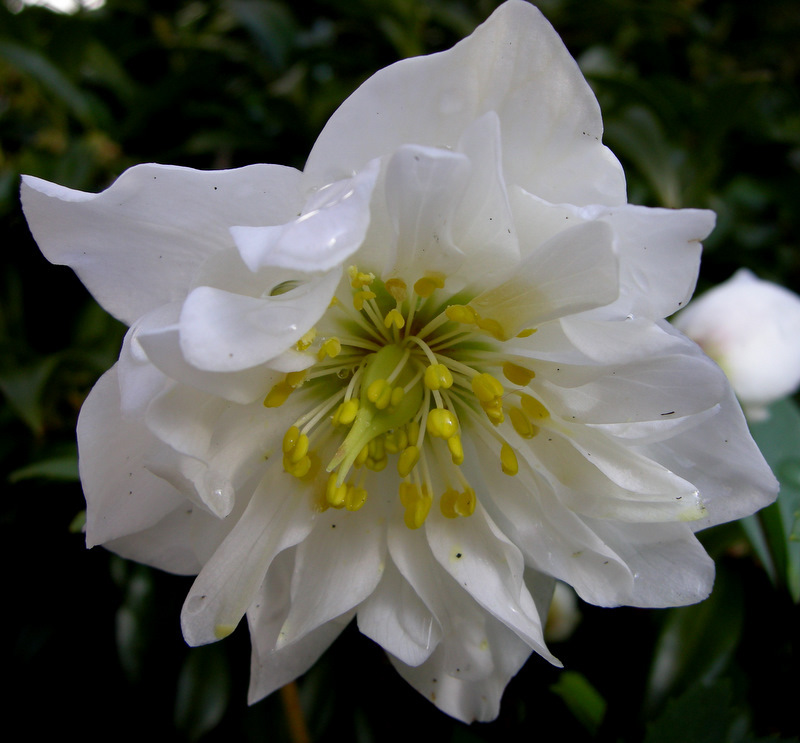 For more information on and photos of camellias, including this one, click here and here. 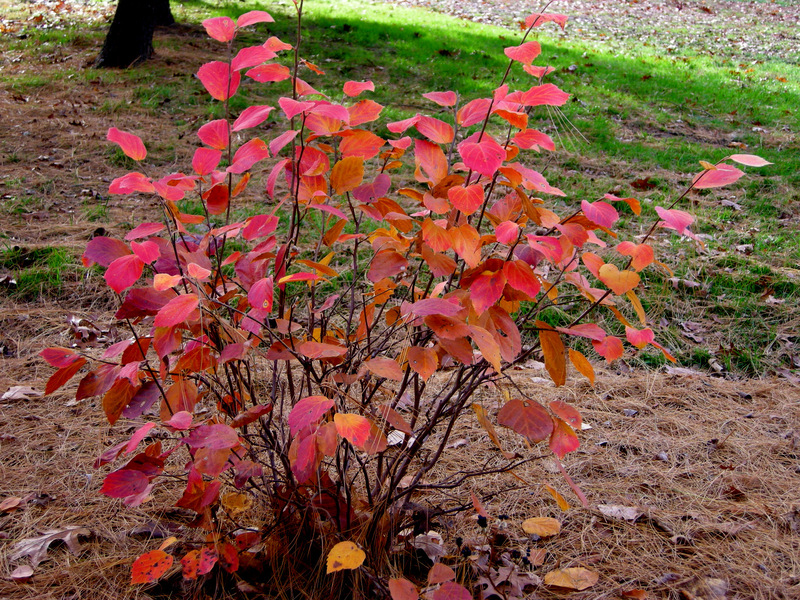 Although they have dropped now, dwarf fothergilla, F. gardenii, holds its gorgeous fall leaves way beyond November 15. 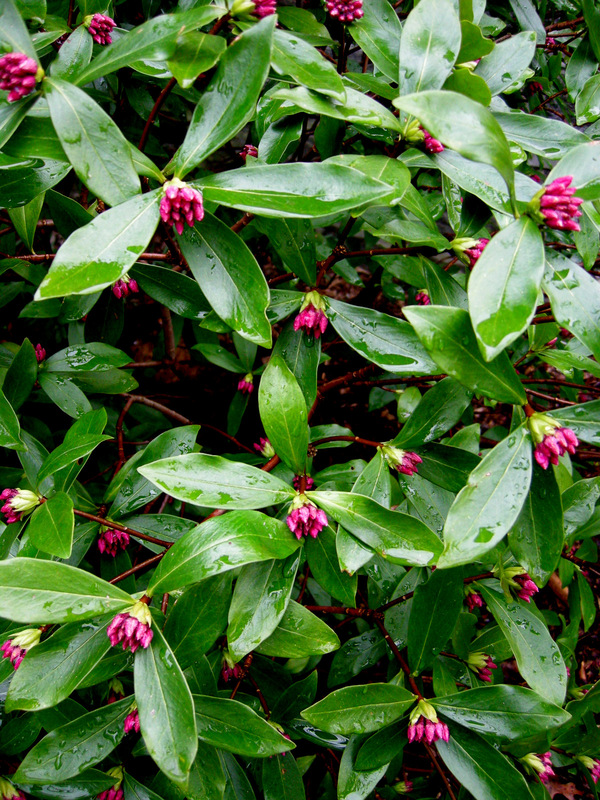 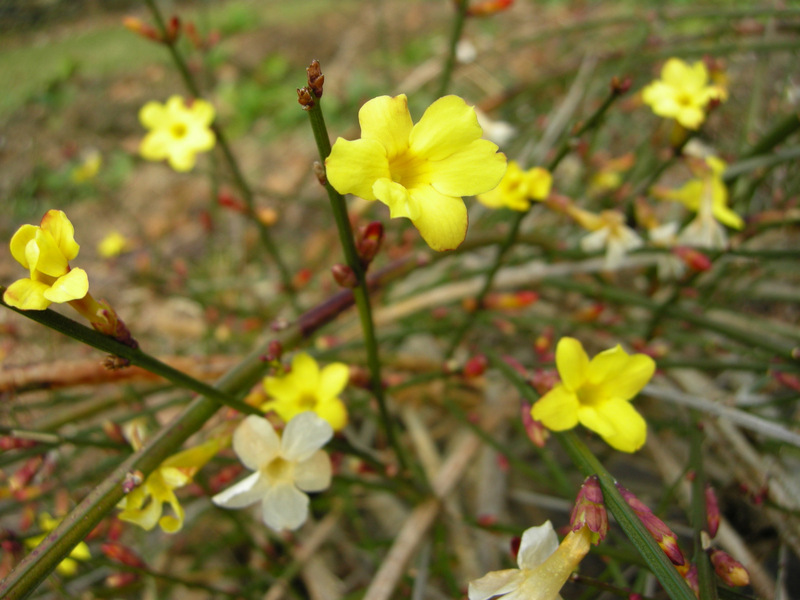 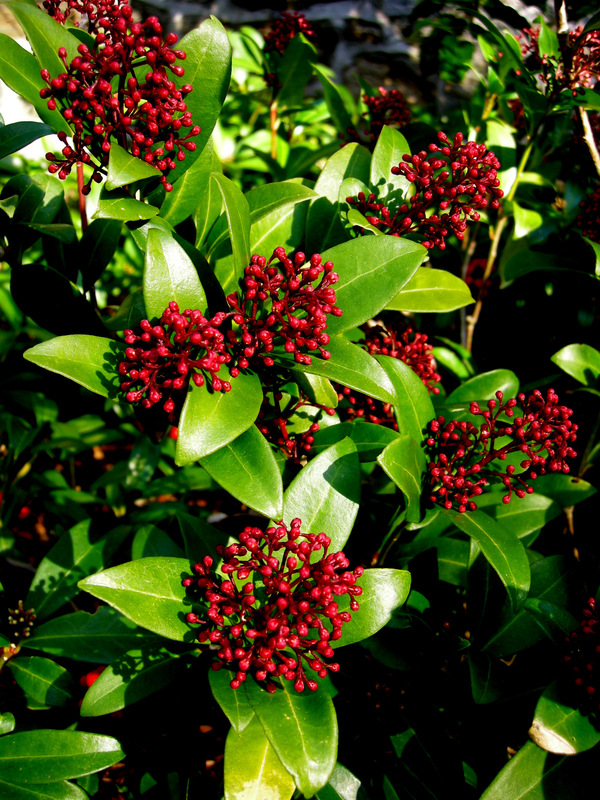 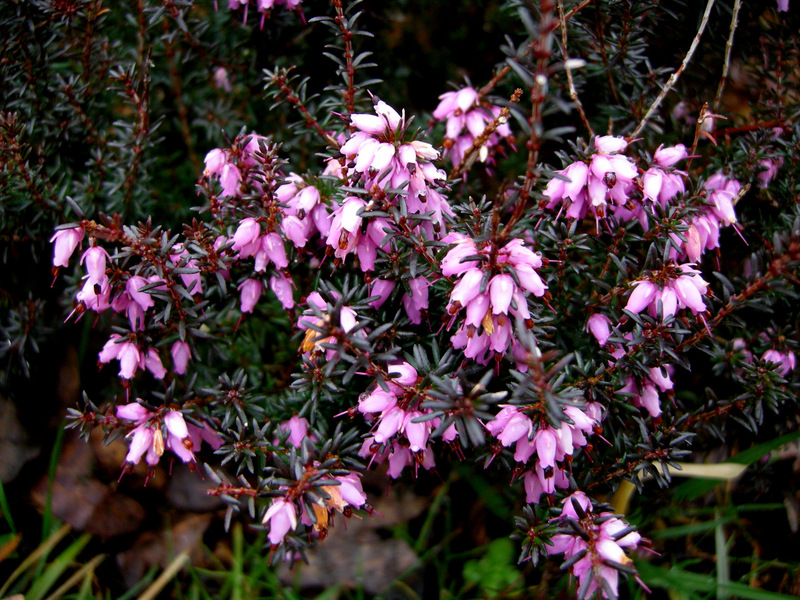 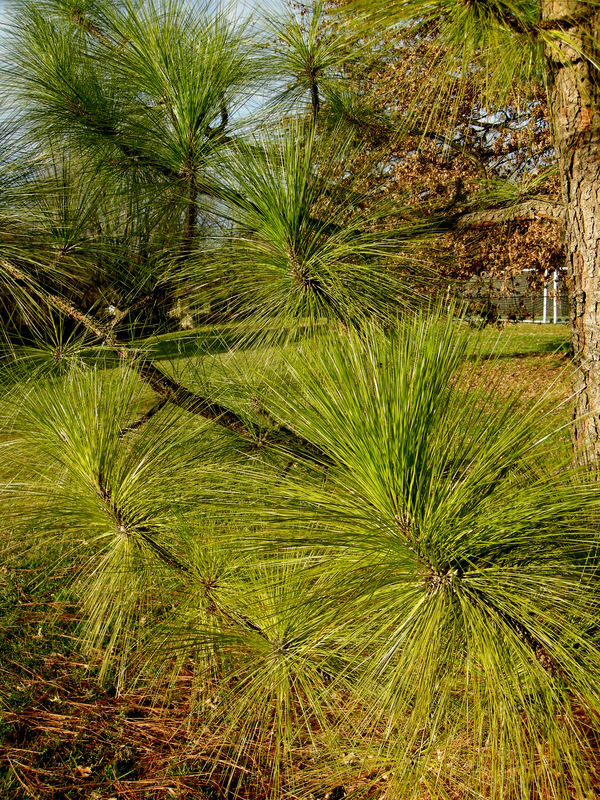 For more information on this outstanding native shrub, click here. 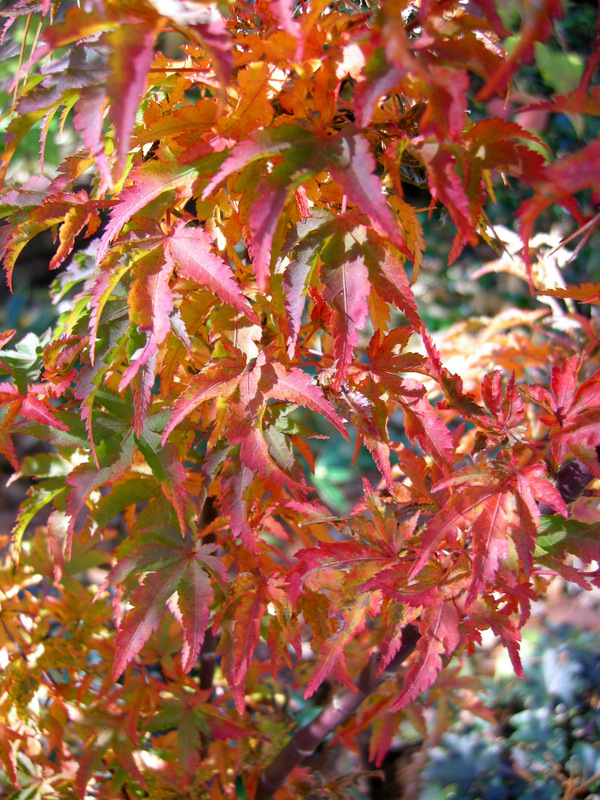 Another woody with late fall color is ‘Shishigashira’ Japanese maple, Acer palmatum ‘Shishigashira’. 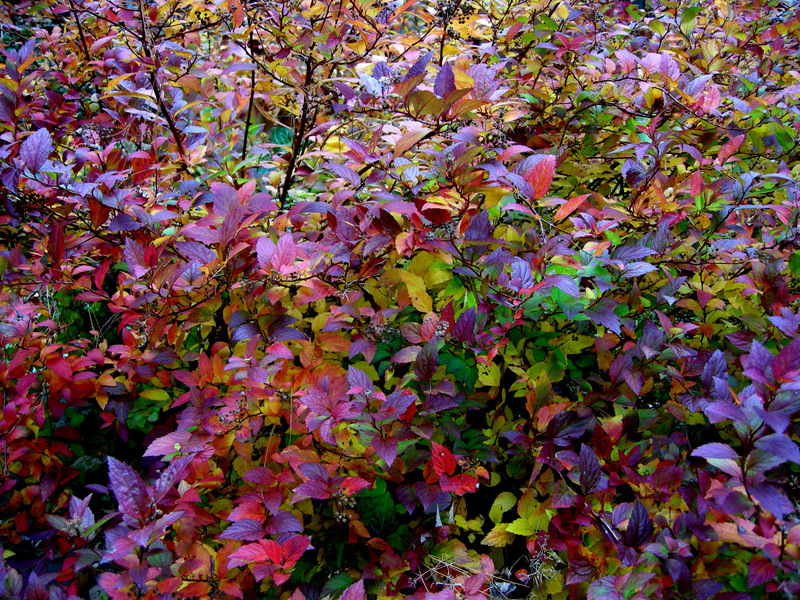 ‘Magic Carpet’ spiraea, S. japonica ‘Magic Carpet’, is still displaying some of its gorgeous fall color right now. 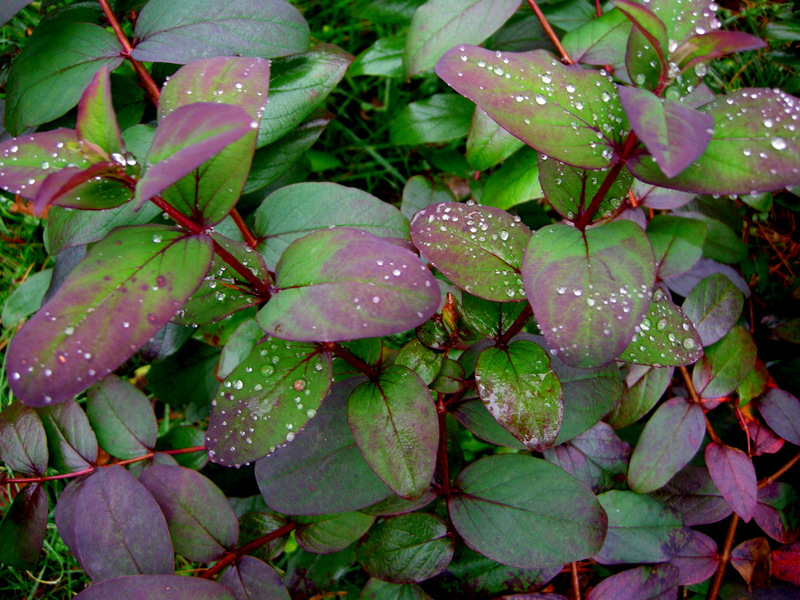 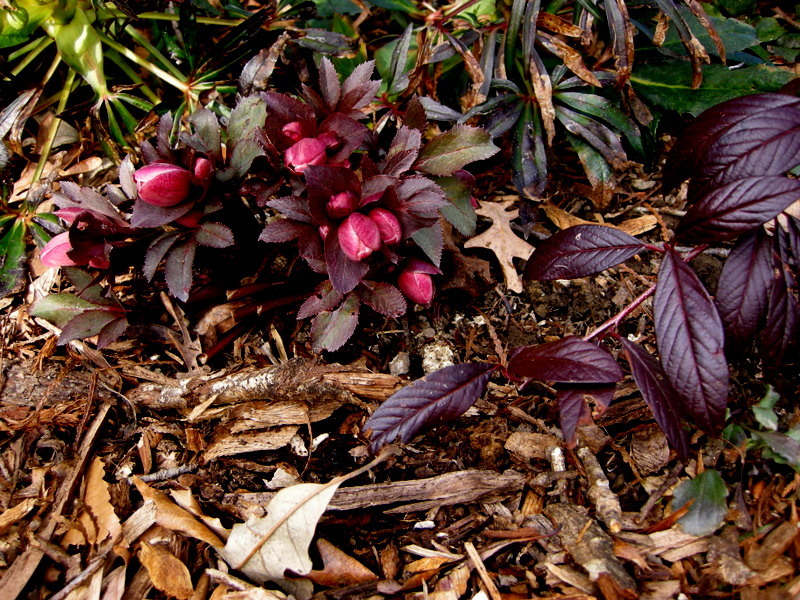 ‘Albury Purple’ St. John’s wort, Hypericum androsaemum ‘Albury Purple’, remains fully clothed in plum-colored foliage. 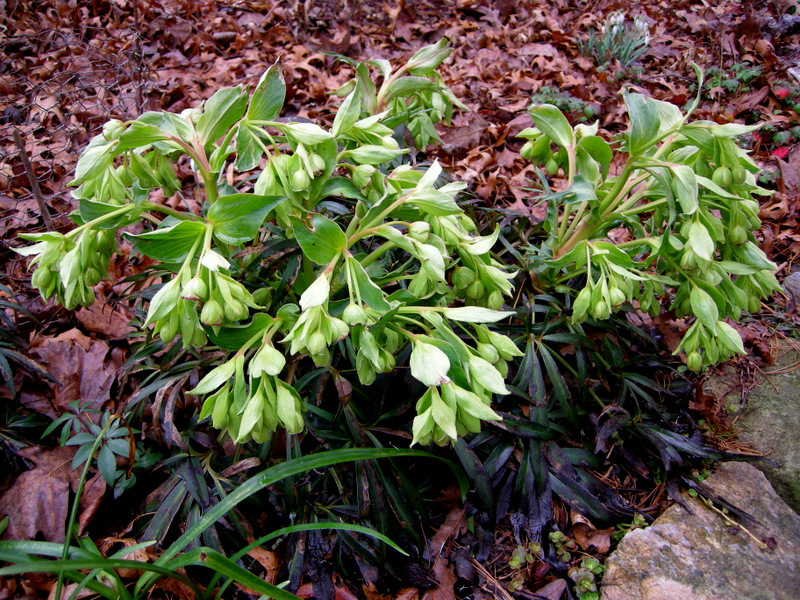 This is the first year that I have grown ‘Cool Splash’ southern bush honeysuckle, Lonicera sessifolia ‘Cool Splash’, but I am amazed to find that it looks like this right now. 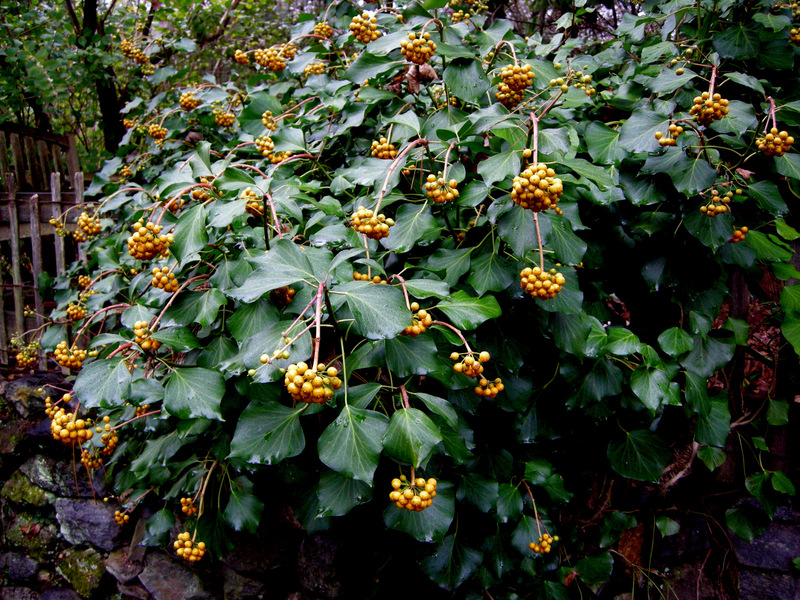 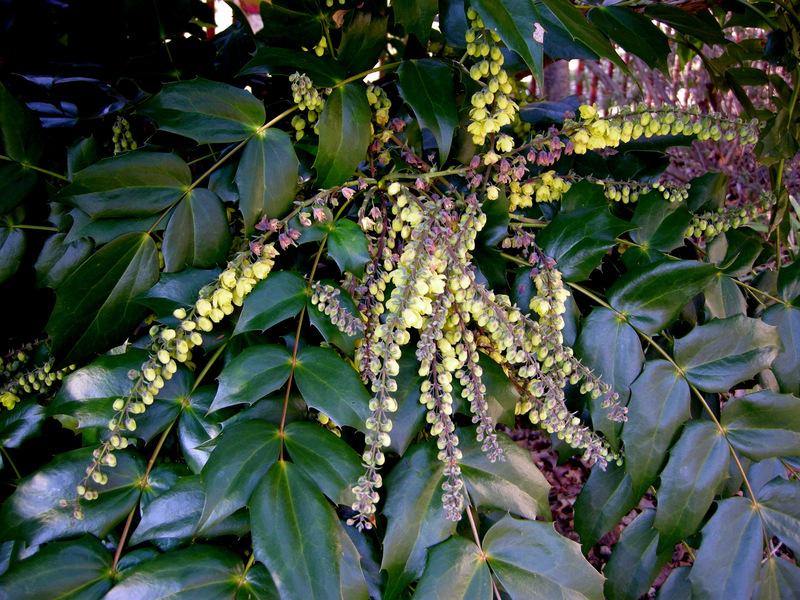 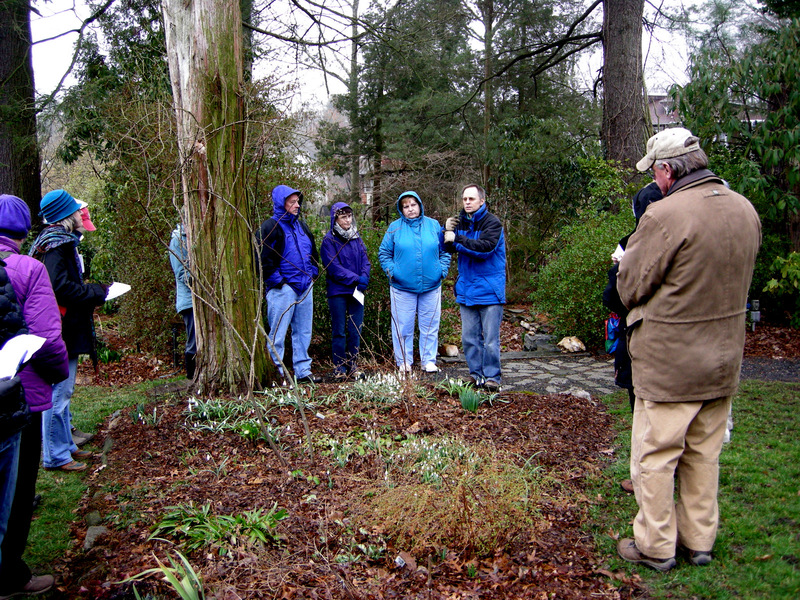 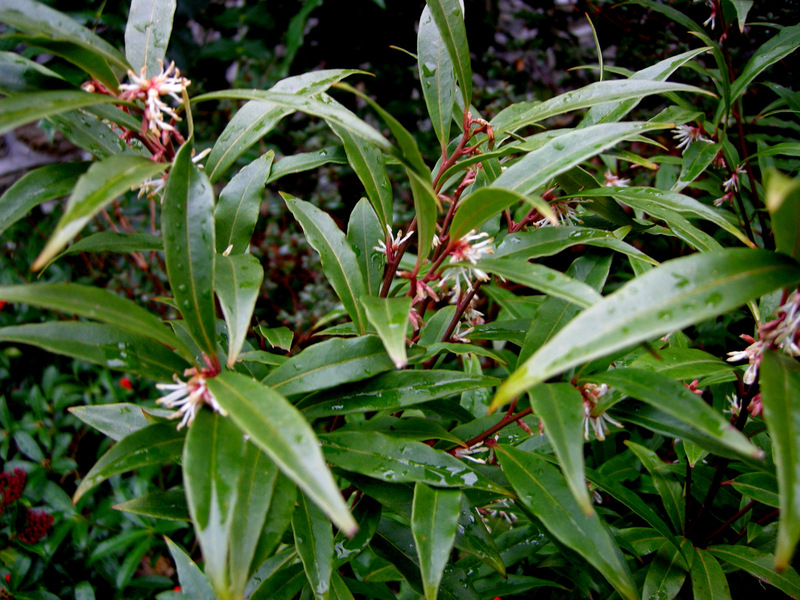 For more information on this great native shrub, click here. 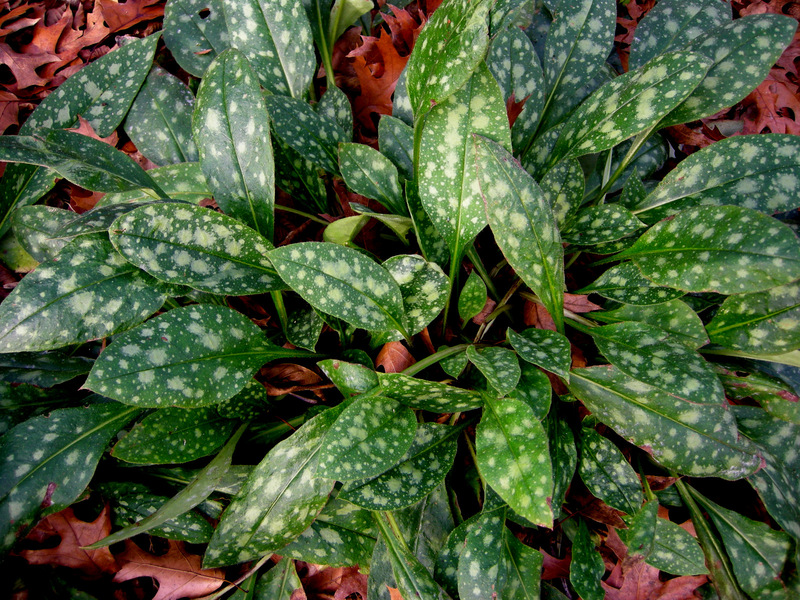 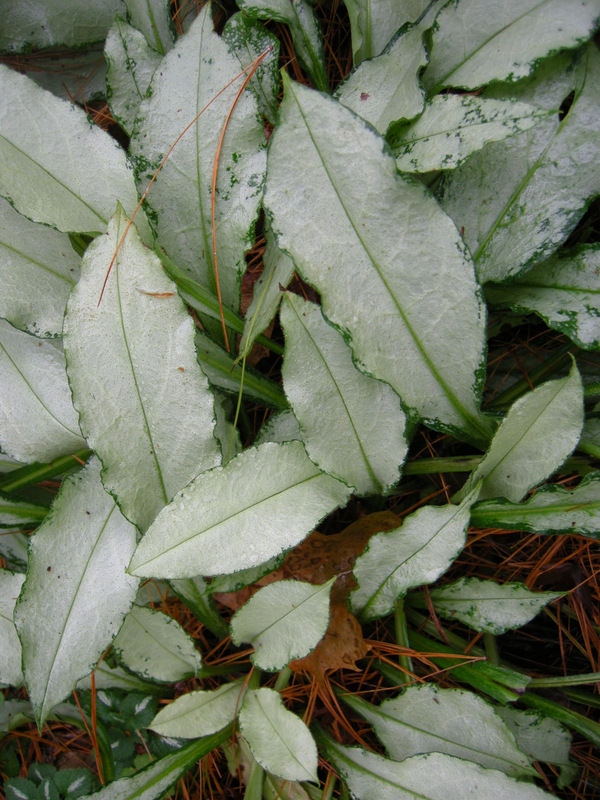 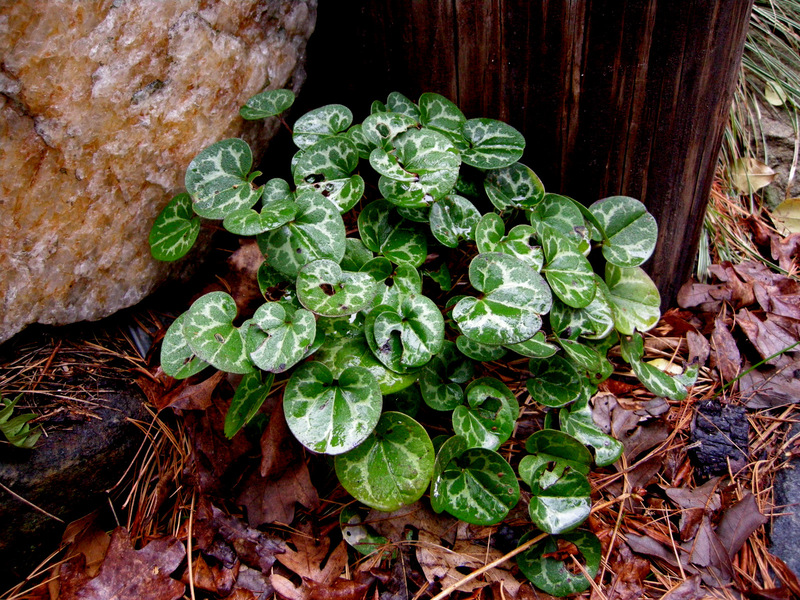 I have over 20 kinds of pulmonaria or lungwort in my garden providing me with beautiful flowers from February to April, but I appreciate them almost as much for their pristine foliage through early winter. 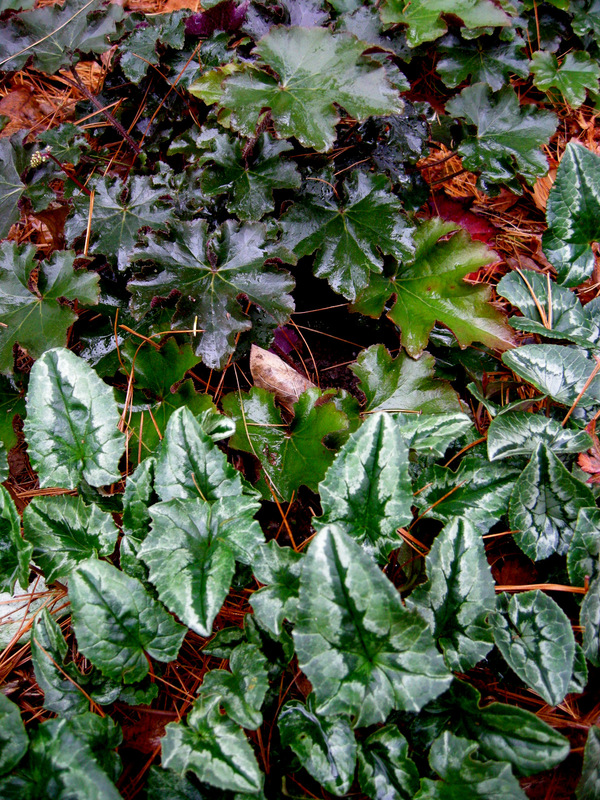 Both native ‘Bronze Wave’ coralbells, Heuchera villosa ‘Bronze Wave’, and fall-blooming hardy cyclamen, C. herifolium, will look like this all winter. 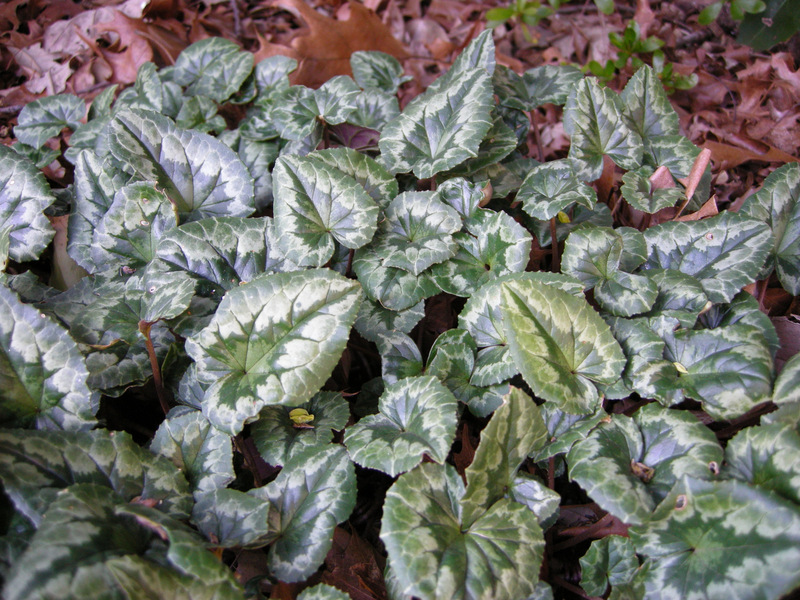 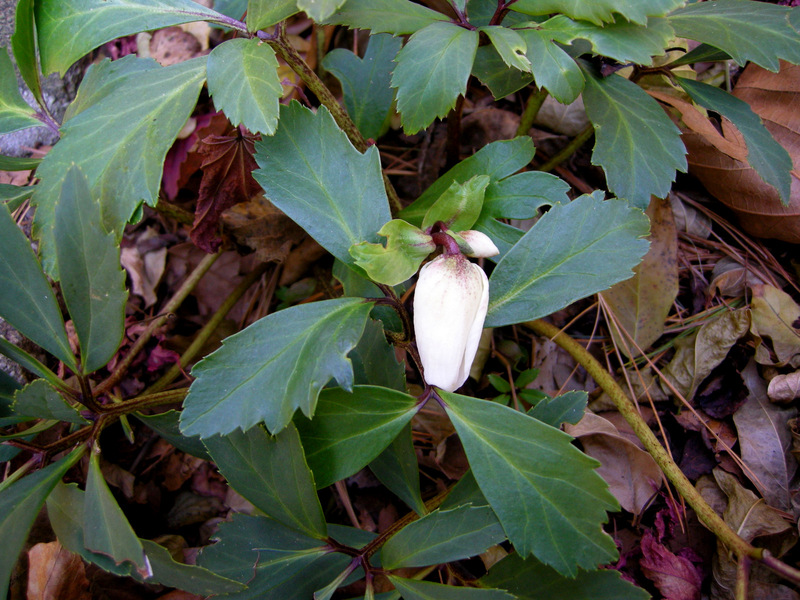 My post, More Flowering Wintergreen Ground Covers of Shade, included several photos of Italian arum cultivars, which are great winter interest plants. 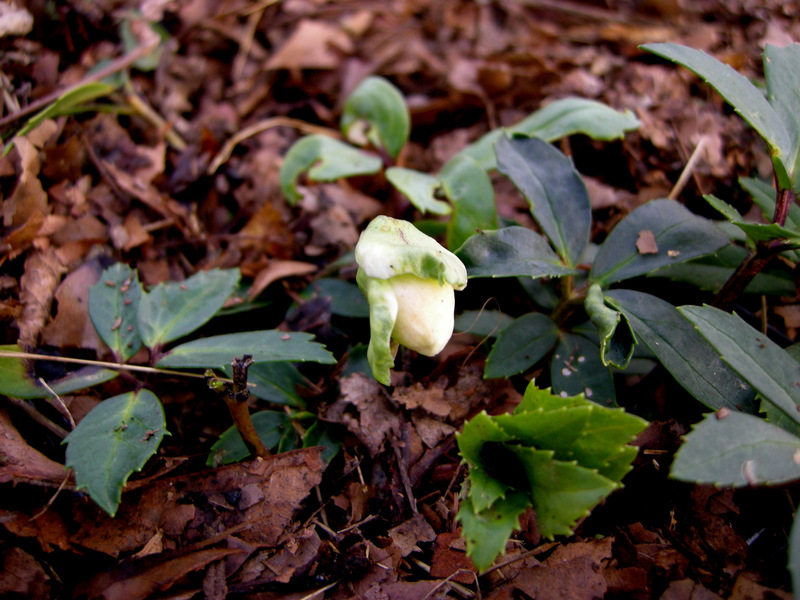 I won’t repeat those plants here but show you a seedling that appeared among my arum. 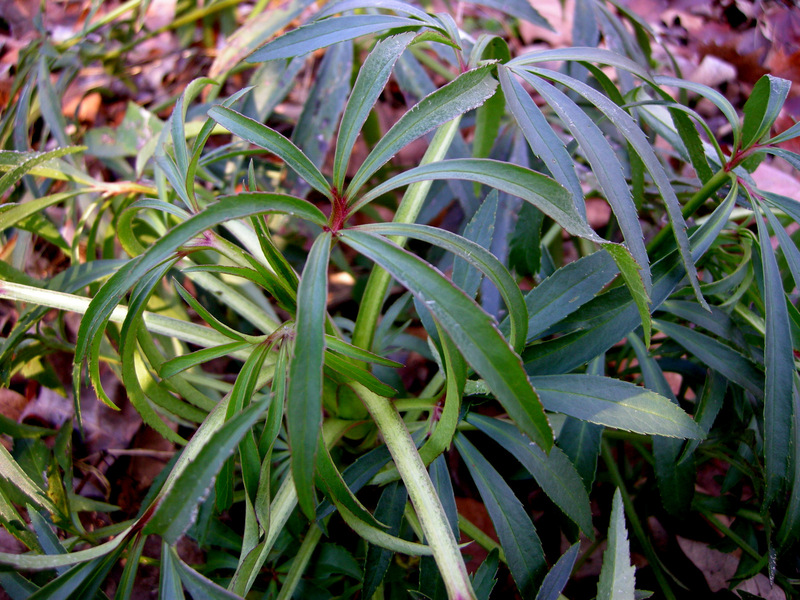 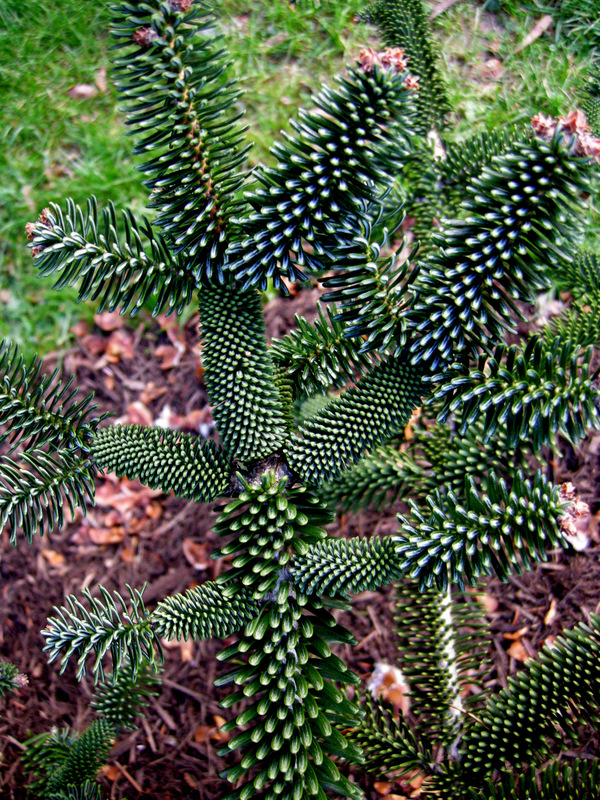 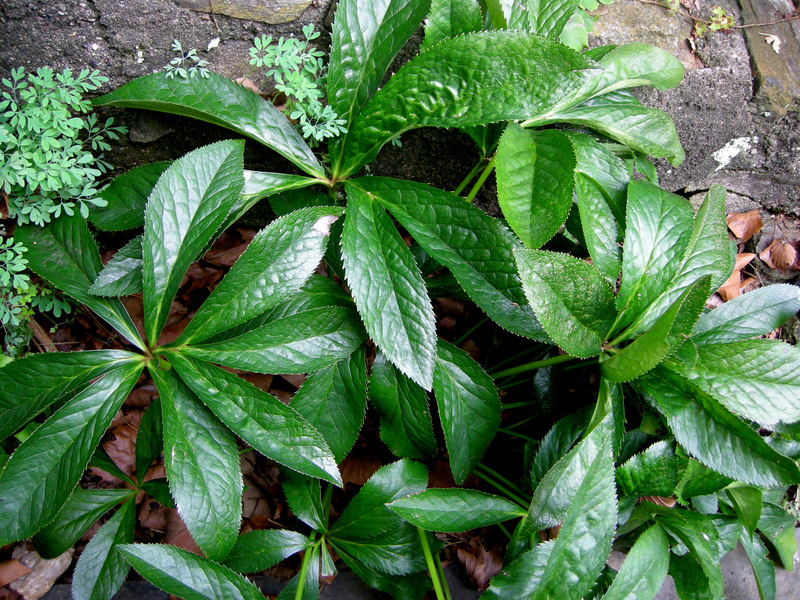 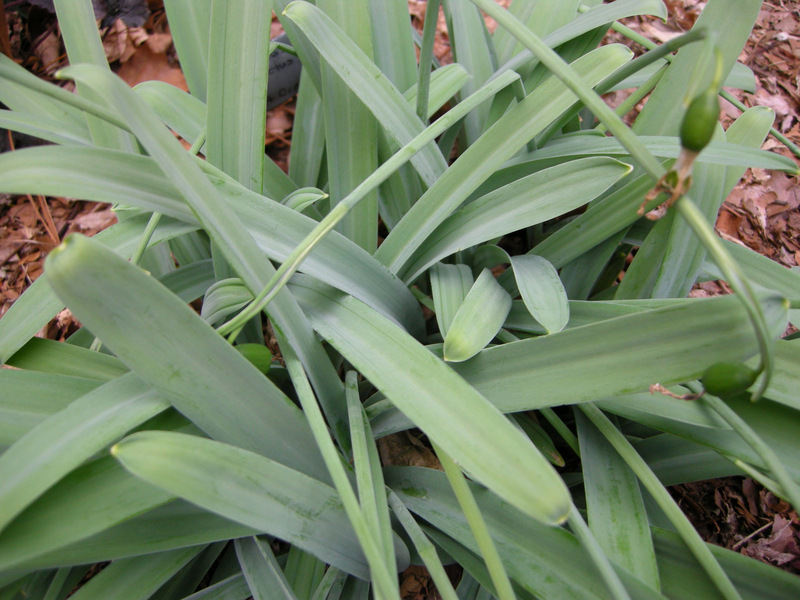 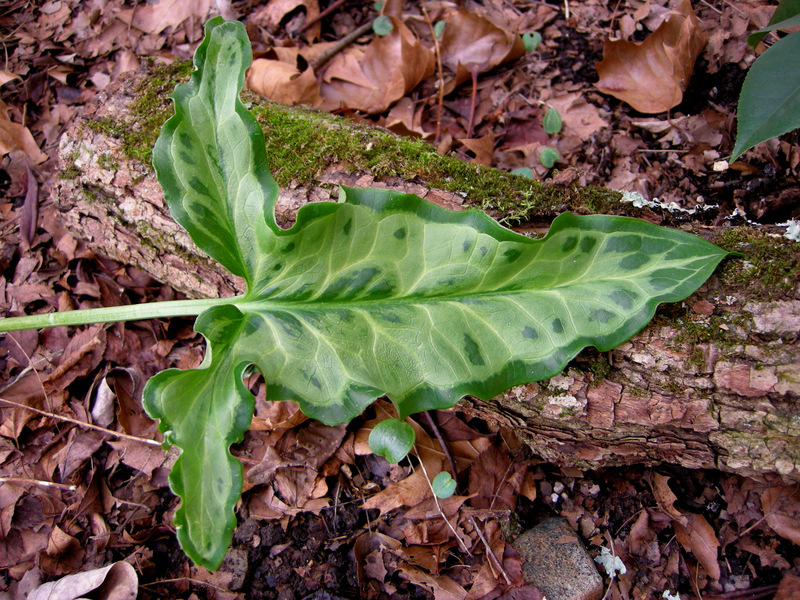 The leaves are more pointy and narrow than the species and the markings go beyond veining to cover the leaf. 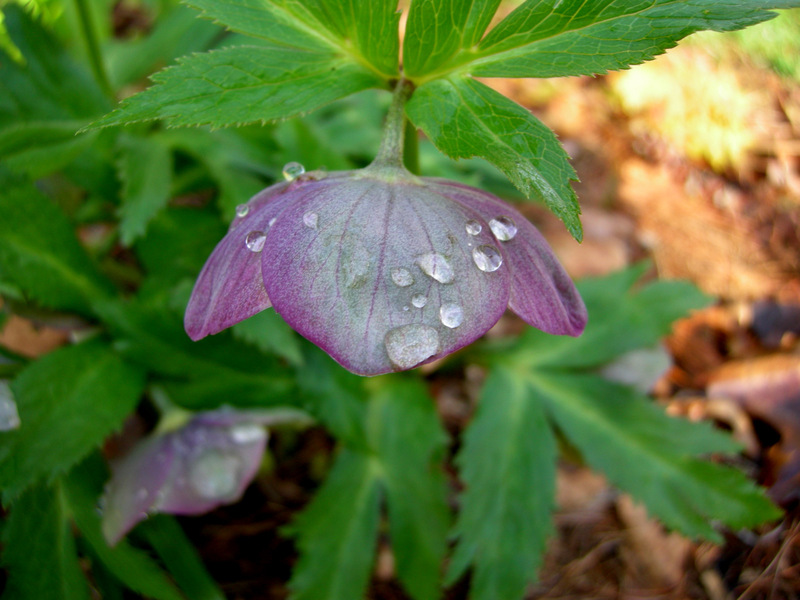 If you would like to look at my photos all year round, please consider buying my 2012 calendar, available worldwide, and free ground shipping with the proper code. 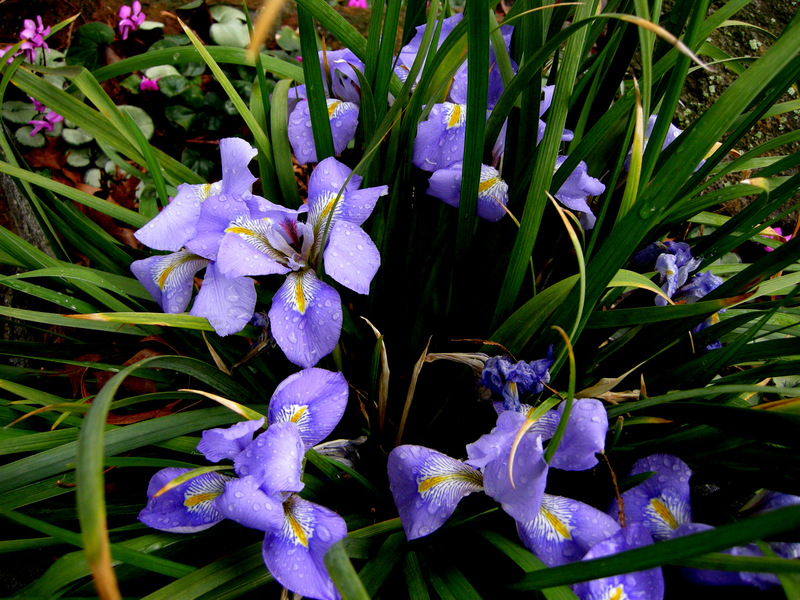 For details, click here.